I reached the bus pretty good in time and had a very warm welcome from our bus driver Jerry and the tour guide Catriona. Don’t confound her name with Caitriona Balfe’s, the names are similar, but different in pronounciation. 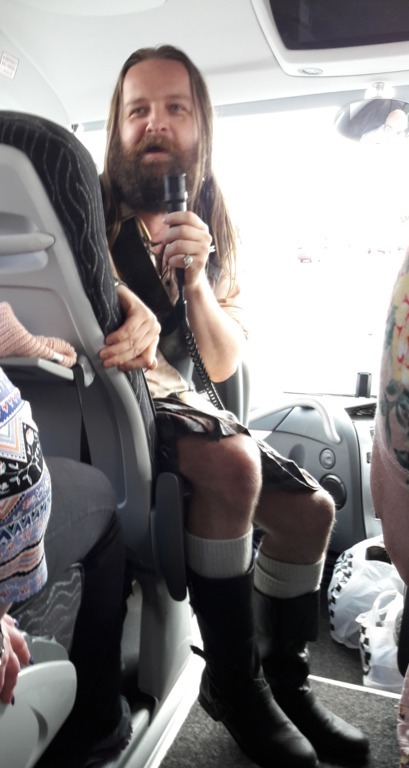 I had booked that online, weeks before, on Slainte Scotland Tours, and the most important point that convinced me was that they picked up their guests in Blackpool and took them up to Glasgow, on demand. This solved my problem how to get northern in the easiest and most comfortable way. We had a very modern, comfortable coach from Glasgow buses. 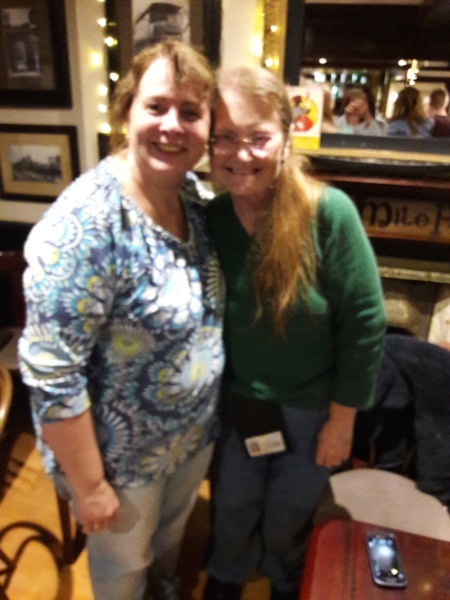 I was going to sit next to Lynn from Tennessee who was going to be my buddy from then on, meaning we would look for another on trips and such, in order to be back to the bus safe and in time. Most of the others were from USA, and to my astonishment, I was the only one from Germany. 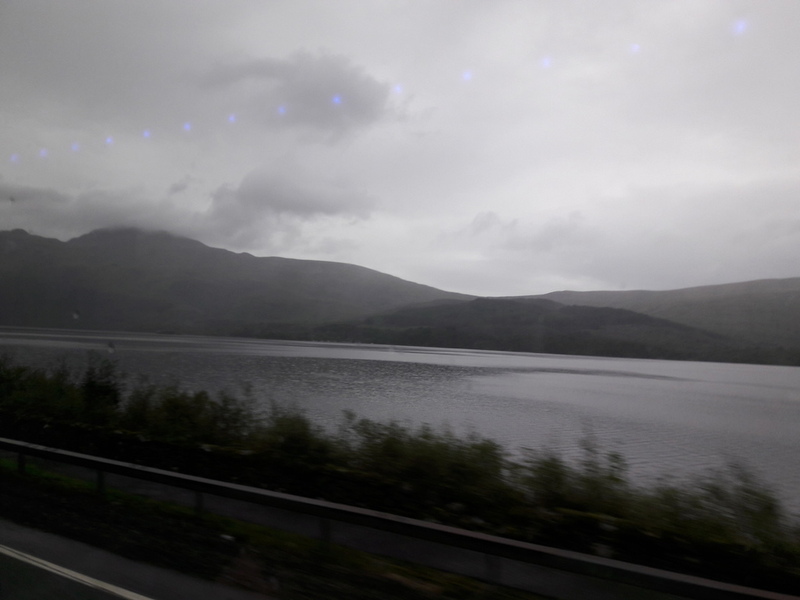 On our way north, we crossed the beautiful Lake District and saw the first mountains before the landscape got flat again and the girls from the US were already quite impressed. We had a short stop at a modern roadside centre where you could buy almost everything in its different restaurant and shops. 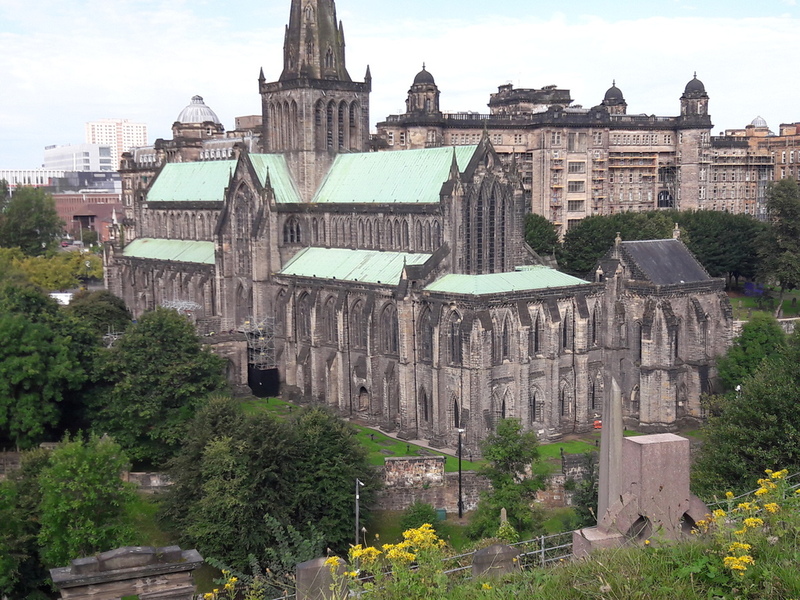 On our way to Glasgow, we had some rain and Catriona decided that this day’s weather was too wet for the visits to Glasgow Cathedral and Necropolis nearby and she postponed these to Friday morning. 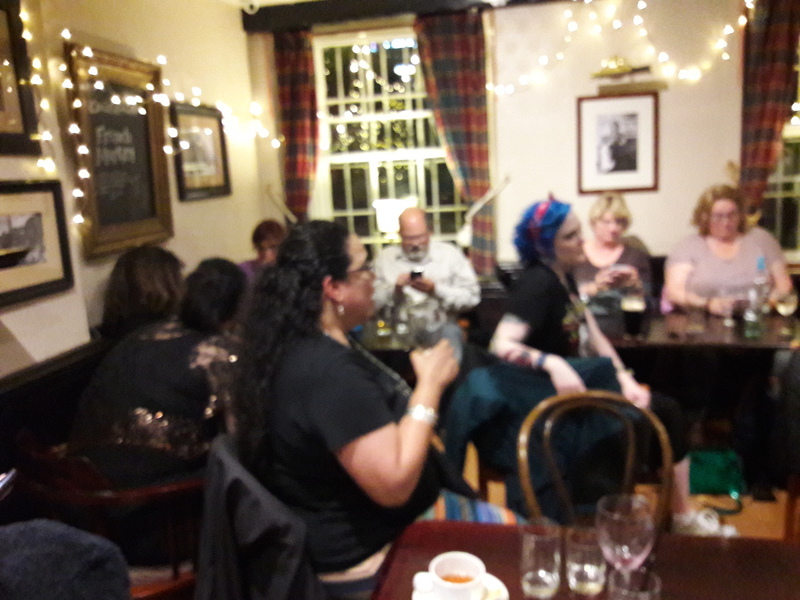 Meanwhile, she put some Scottish folk music on the speaker, for example a song about the massacre of Glencoe which even though it happened more than 300 years ago, still is very present to the people’s mind because of the great tragedy included. 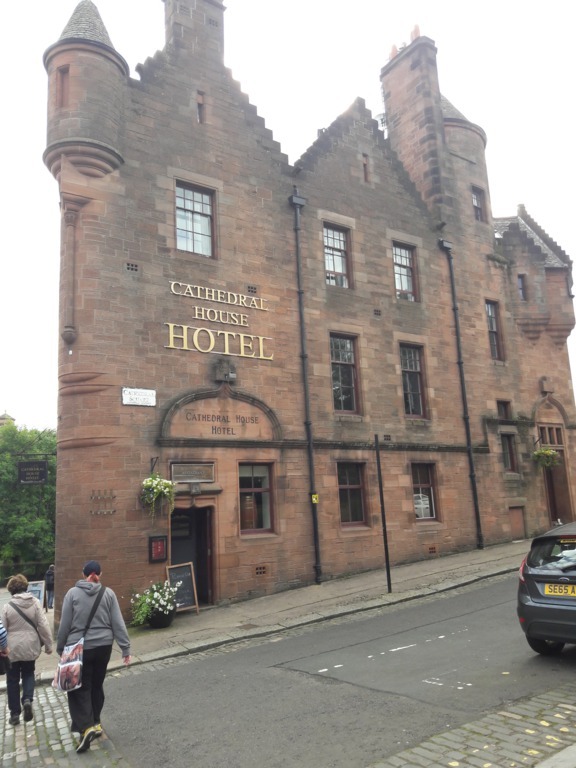 After Catriona had brought the other 4 guests to their hotel, she took me on a tour through the city – others would call it a detour – to my hotel. 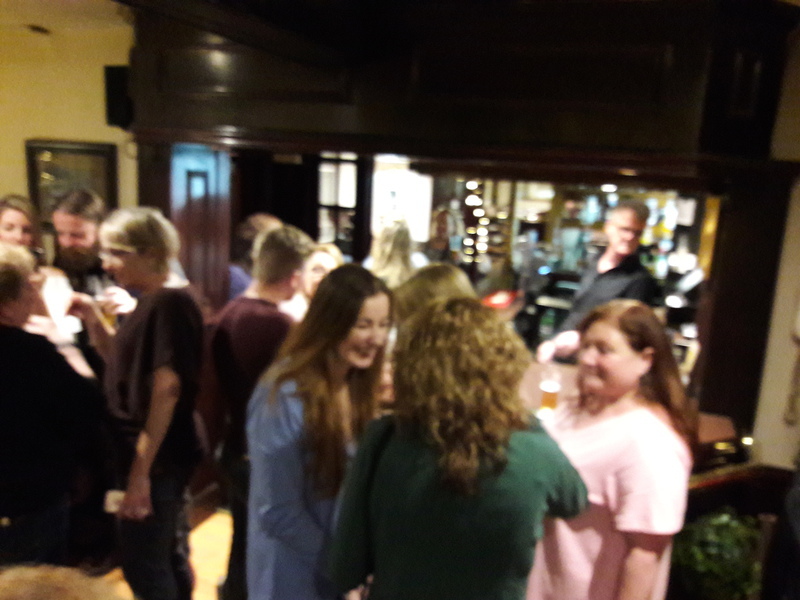 There was no time but for a short check-in and to put my luggage into my room, then we raced back to the homely part of the day, to gather in the sublevel pub of the Argyll Hotel for a welcome drink and to better get acquainted to each other. We had to stand up one after another, tell everybody who and where we were from, show a small dance, tell about when and how we had come to the books or the TV series and to learn a little more about the others. Most of us were from the US, a handful from Australia, two from Canada, one girl from the Netherlands and me from Germany. Tuesday morning was cloudy with some rain, but the forecast for the afternoon and for the following days was promising. To be prepared for all possibilities, I had an umbrella, a rain coat and sun glasses with me. My hotel was too far from our daily meeting point, so I came by taxi that Diane from Albion hotel had ordered for me after an early breakfast. 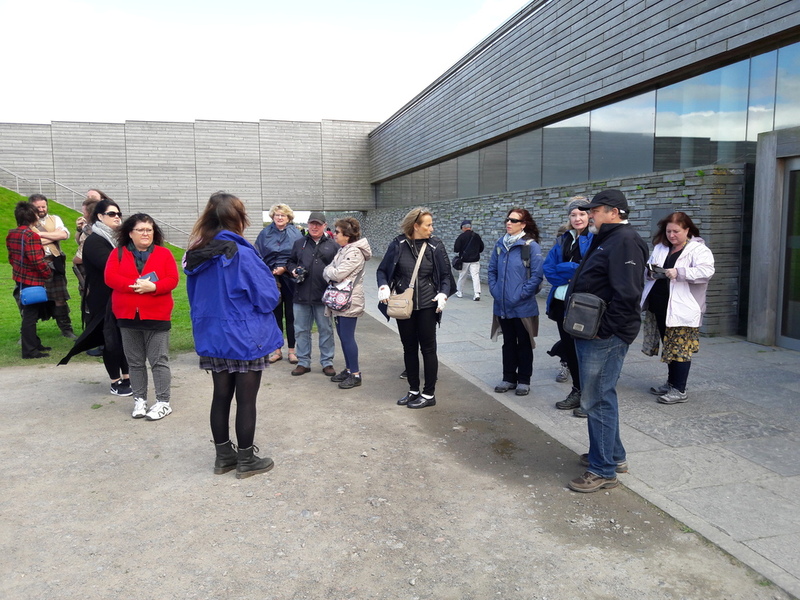 Wet got started a little later because our tour guide Catriona got stuck in traffic, but then our star guest of the day, Adhamh O’Broin (Gaelic consultant of the series) got an enthusiastic welcome. He was with us all day, gave information on historic and political aspects, also told funny stories and sang many songs a capella for us. 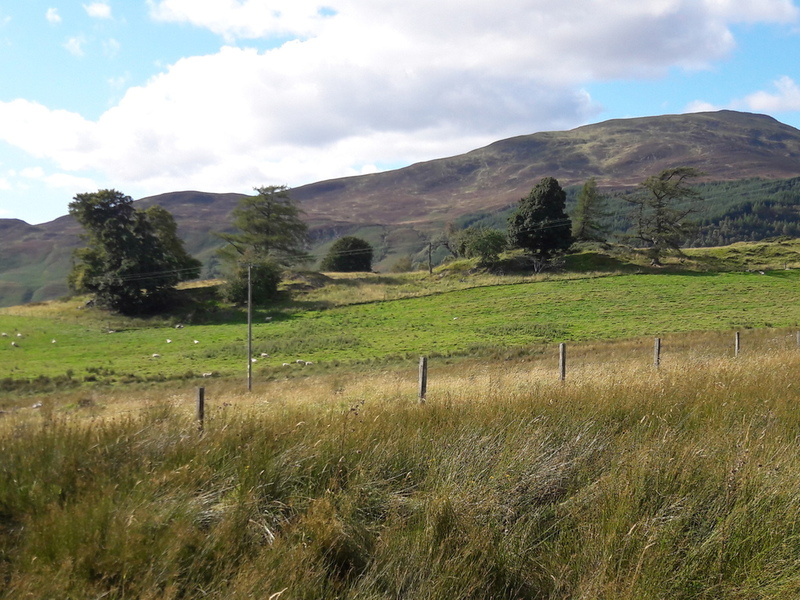 We started northbound towards Loch Lomond’s (one of the biggest lakes in Scotland) natural preserve and through Argyllshire, wonderfully located. 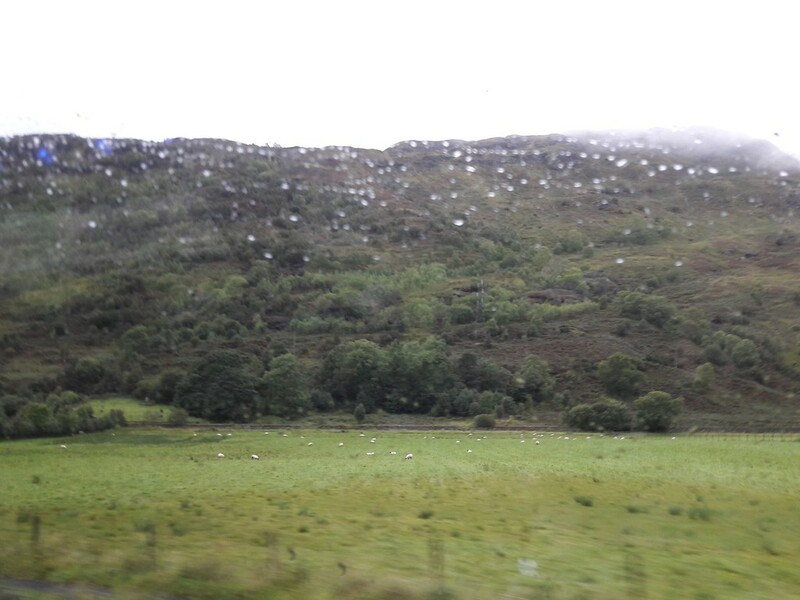 We took the motorway A82 northwest, then we dived into the amazing, wild and misty landscape, up the road to a mountain pass called Rest and Be Thankful to a view point into a wide valley. After a stop on the parking to take some pictures and stretch our legs, we drove on to the Auchindrain Highland Museum, an outdoor museum, being the only preserved village from before the last civil war in 1746 and the following “clearances” that killed or expelled the majority of the Highland population. Most of the houses we saw were very well preserved and some were furnished; we could go inside, some of them had a new metal roof to protect them, others were partially or completely ruined. But we still could feel the special atmosphere of the village. 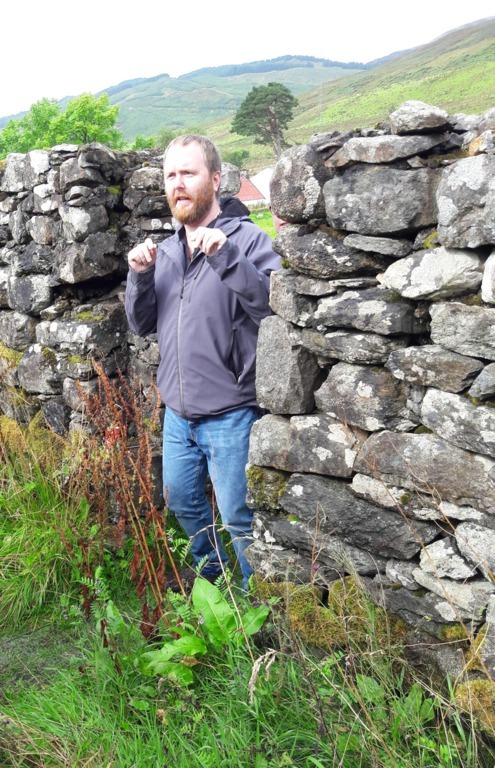 Adhamh wonderfully explained the common welcome culture in the Highlands, no visitor was ever sent off. 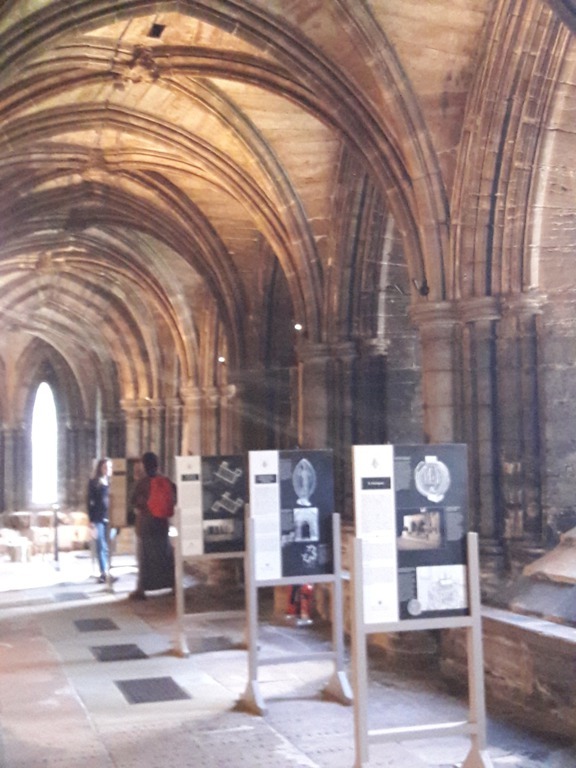 The visitor would greet like (in Gaelic): “Hello, are you still alive?” and the answer would be like “yes, come in and sit down!” and the visitor would come in and sit down on whatever he could find, not necessarily a chair. 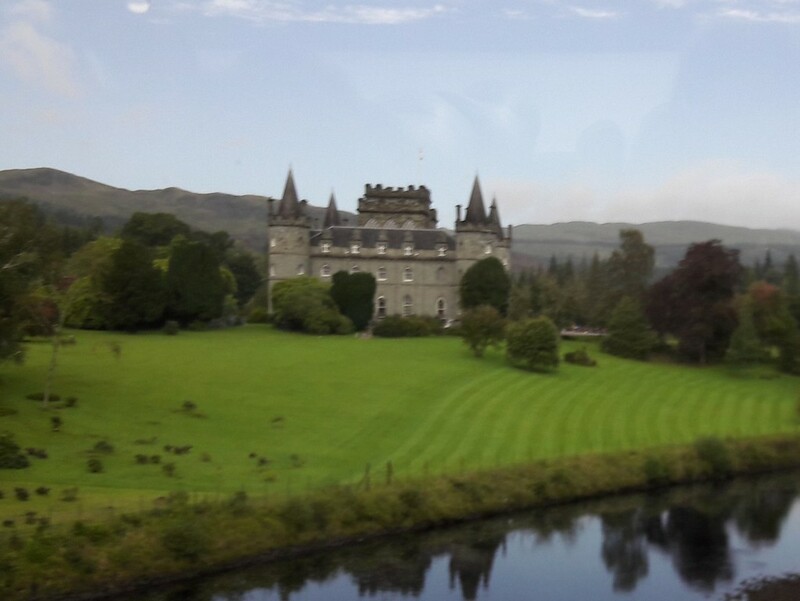 We continued to the picturesque village of Inveraray for a short lunch stop. 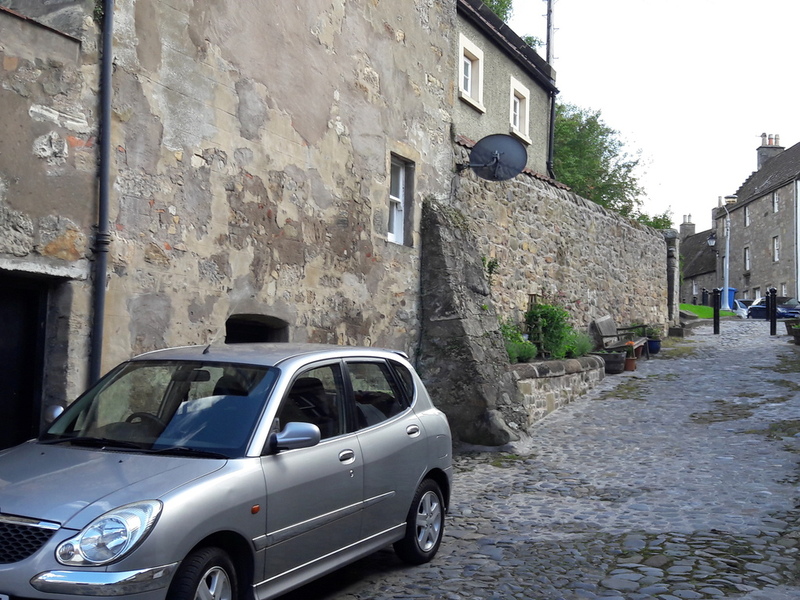 We left the bus on a car park and walked to the main road of the village, where we found small shops and restaurants and bought sandwiches, fish & chips and some souvenirs. 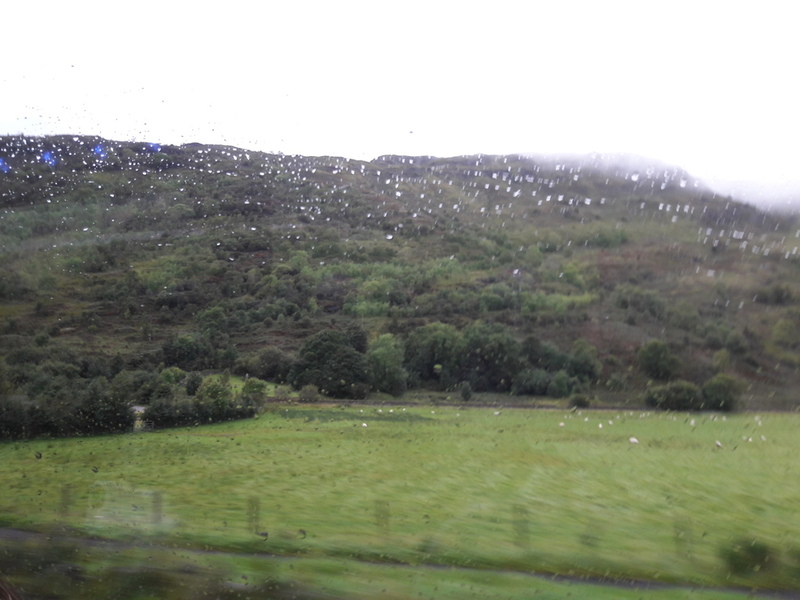 I bought a shawl in Black Watch tartan, matching with other garments I already have and immediately, I could make use of it as it started to rain heavily on our way back to the bus – but fortunately, the last rain on that day! At the contemplative Kilchurn Castle, we could make only a short stop as Catriona didn't want to take any risks for visiting after all the previous rain, so the castle would be to muddy and slippery. 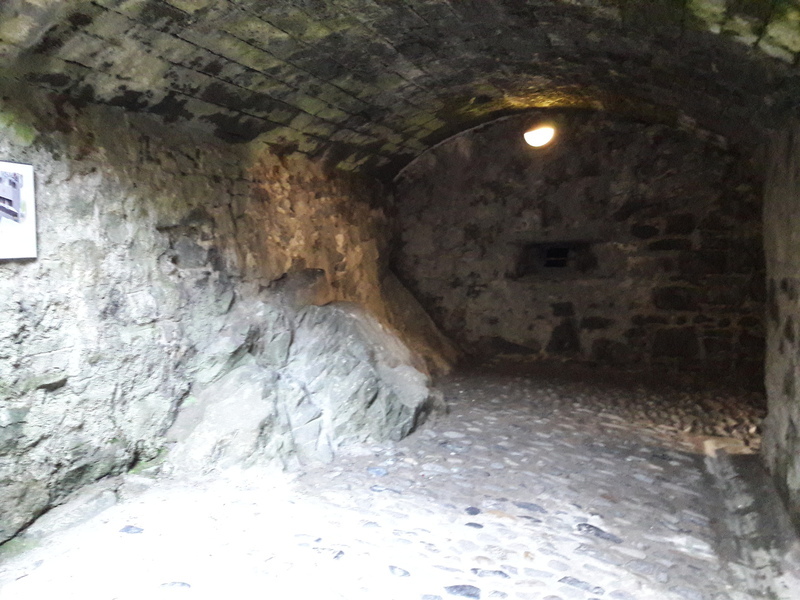 But Catriona refunded us by telling the a ghosty story about her visiting the castle earlier last year. She had come on a snowy spring weekend with her family, wandering towards the castle with her younger daughter on her hand, when a guy came from behind, with red hear, wild beard, in a kilt and barefoot, passing them and running downhill like a maniac, crying “run” (in Gaelic)...and disappearing into thin air... Her daughter also had seen the man. We made a stop by the main road to take a few pictures. In Kilmartin Glen, we eventually visited “real” circles of stones, first an old, big one on a big, flat field, with only a few stones left, which, by their size and shape, really reminded us of Outlander, second, behind a path and a fence, a big circle of standing stones with the inner circle completely filled with very big pebbles. A former grave place, a smaller one to the right side, Adhamh told us more about the ancient culture. He also warned us to not touch the standing stones, though we wouldn’t be transferred back in time, we’d just be dead... but staying overnight was not dangerous. Well, we did not die, but we just had to touch! At Dunadd Hill, a fantastic view point, a small, but steep hill in a flat area, we didn’t have time anymore to stop and because it was to slippery and dangerous that day. Catriona wanted all of us to arrive home safe and we were far behind our time schedule. That day, we learned a big lot about Highland culture, how Scotland was systematically oppressed after the Jacobite wars and even before (from 1603 on, after Elizabeth I died and England and Scotland were united under King James), that Scots is an independent language, no dialect. That Robert the Bruce’s brother didn’t intend to conquer Ireland, as the English allege, but that they were invited by the Irish and wanted to help them set Ireland free from English occupation. For dinner, I didn’t want to walk far and decided to go to the Italian Restaurant Eusebi Deli & Trattoria in Park Road (side road to Great Western Road), where I already did have a fantastic dinner the year before. The restaurant was only 5 minutes by foot from my hotel. 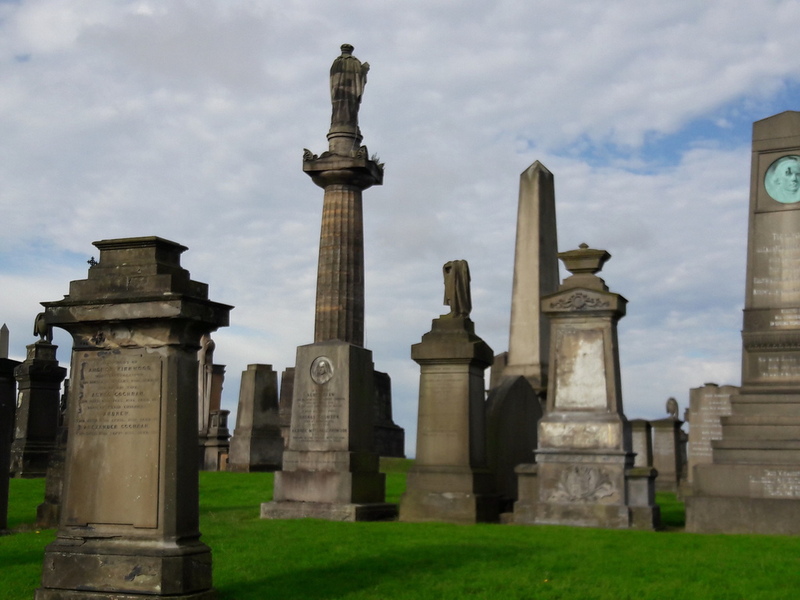 Wednesday, August 30th - Glasgow, Inverness, Culludon, Clava Cairns etc. This was the day with the longest route that we had, we drove northbound towards Inverness. 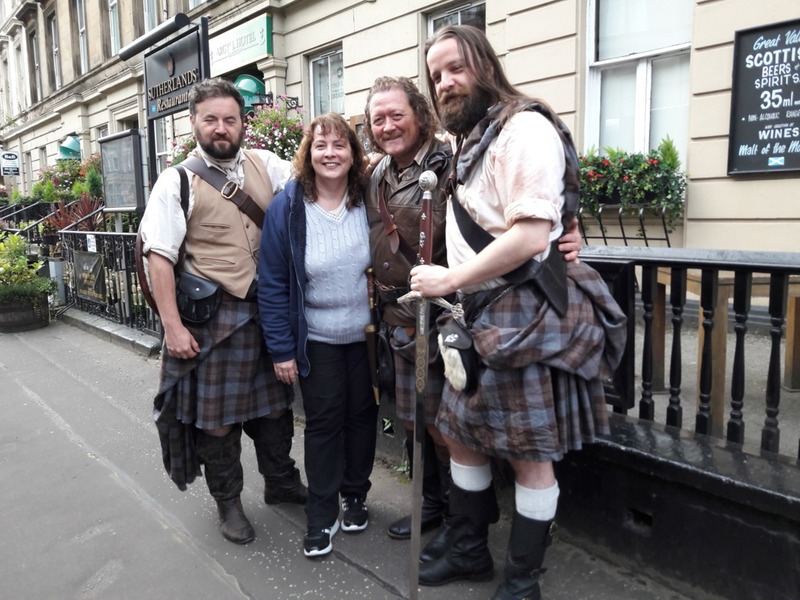 But for the very first, we met our companions for the day, three Highlander impersonators, Jay, John and Grant from Paca men in full dress, meaning Fraser tartan from Outlander. They were allowed to buy their costumes after the end of the production and jazzed them up with some personal belongings such as sporran, sword and dirk! After a few group photos, we finally could get started – but my buddy Lynn was missing! We thoroughly searched for her in and outside the hotel, desperately called her on room and cell phone and finally had to leave without her. We were really concerned, Catriona never had had such a case before, then eventually we had Lynn on the phone and heard that she just had overslept. She would miss a wonderful day with us, but she was clever enough to make herself a wonderful day, too, so she told us about next day. Since this was going to be a long drive, the guys were asked one after another to come forward in the bus to entertain us. The first was Jay and he sat down first row. The first question was – how could it be different in a bus full of girls? – what was he wearing under his kilt? His diplomatic answer – “just a great big smile”. We asked about the shootings, of course. Such as the others, Jay had been part of season 2 and 3 and could tell a lot, for example, how in one terribly cold winter scene, he had to stand guard for hours and when he left for a break, he was frozen and so stiff that he couldn’t bend his knees and needed help from a young assistant; when Sam saw this, he laughed so heavily and just couldn’t stop laughing, he had to get hold at the door frame to avoid falling down! Caitriona, however, remains also in shooting breaks very concentrated, so in the beginning, he was quite unsure how to behave towards her, because he thought she looked angry, as if she would stab him now, but then he found out that this was just her concentrated face. The battle of Culloden (first episode of season 3) was shot with 200 actors and before, the production made some kind of boot camp with them, so that the organization could find out who of them did have what kind of fighting abilities and immediately after, they just started shooting and fighting, just two or three were fighting each other and the camera would just stay on them – it was like a boy’s dream come true, he said. One day, Jay also played an English soldier, he played different roles, the two others always played the same role in season 3. They were not allowed to take pictures on set, however, they had some on their cell phones which they proudly showed us, one after another. 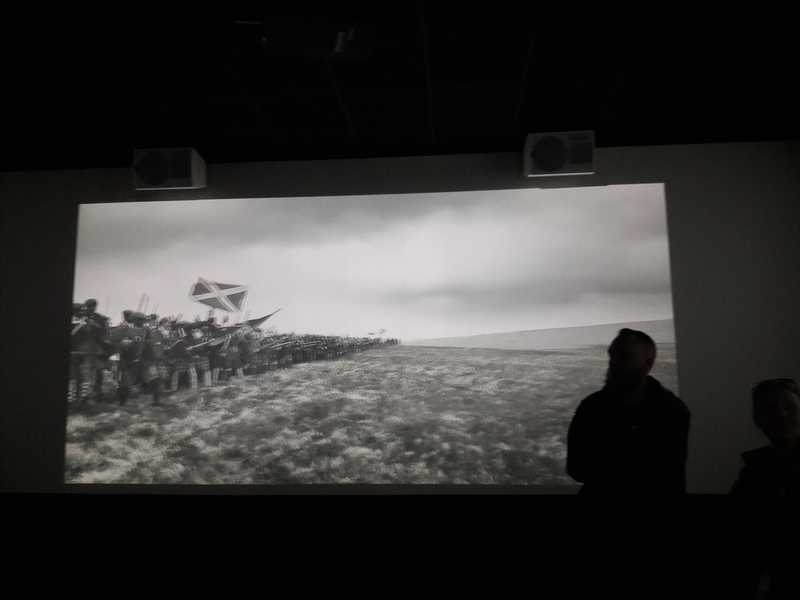 To shoot the battle of Culloden, they shot one week, three days just fighting (1 day of shooting takes really long, minimum 12 hours, mostly much longer, with makeup and costume), another day with marching and one complete day lying on the ground dead, on icy, cold, muddy ground and often, the director would make a cut because someone was farting, snoring or was laughing about another one’s joke. Then there was a scene that we had already seen in a trailer, with Claire walking in a cold winter night, in nothing but some kind of nightshift (just a whiff), over the battle field with all the dead men lying on the ground and they were not allowed to look up since they were dead. Once, when they fought, Tobias fell upon him (Black Jack also dies in that battle, without telling too much) and he was quite heavy, really strong and full of muscles. Next one was John Duncan who told us how he stood watch on a mountain ridge in winter, it was (of course) freezing cold, all these scenes were shot last year in Scottish winter and somebody from production brought blankets, so he was happy already – until he found out the blankets were but for the horses. In season 2, he also played a seaman in Le Havre (episode 12) and a villager in episode r (Rent) in season 1. Tobias Menzies is a fine, humble colleague, but when he’s playing Black Jack Randall, he stays in character also in shooting breaks and nobody wants to cross his way then. 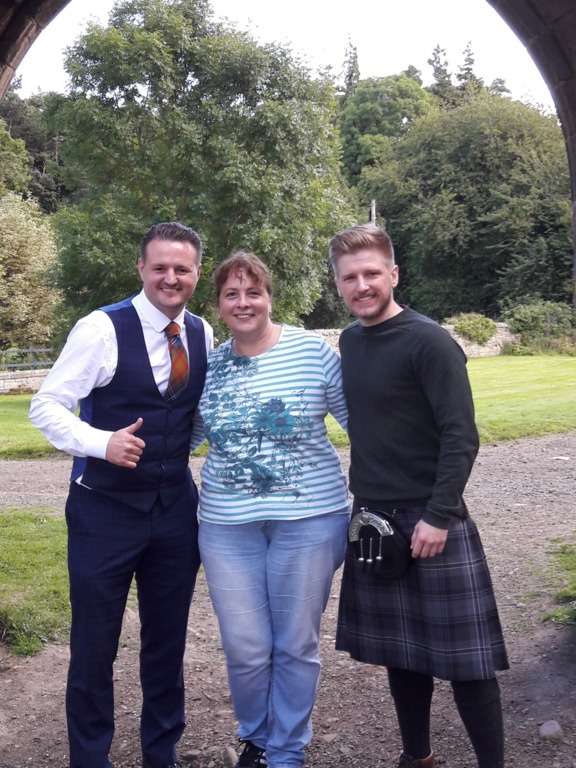 There also was a funny story with one of his co-actors, when he asked the one behind him while marching to arrange the back of his kilt and after a while, when it felt a little windy, he found out that the back side of his kilt was all put up and his buttocks exposed. If you look at the pictures, you will see that these men are wearing the kilt in the traditional way, just everyone a little different (there are tutorials on youtube), the kilts are a five to six meters long piece of fabric, not like the modern kilt which is actually some kind of a pleated skirt, with firmly sewed and fixed pleats. They put the fabric on the floor, arrange it in regular folds, put a belt underneath and roll on the floor to close the belt, then they arrange their back side – ready! Those who want to see it, please search on youtube for the video “How to put on a plaid Andy the Highlander”. Now, we had reached our next stop in Pitlochry where also the famous Blair Atholl Whisky Distillery is located. 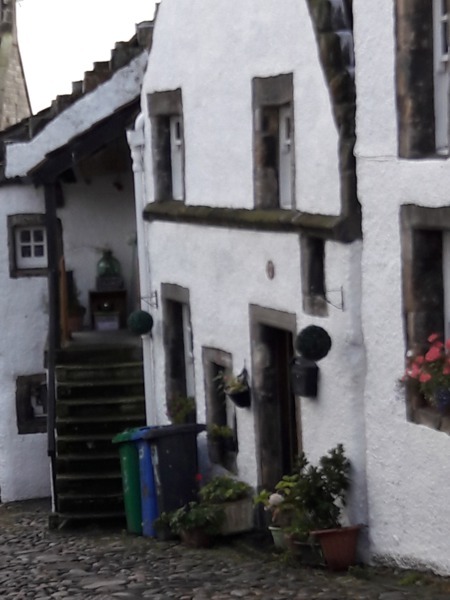 Pitlochry is a beautiful, picturesque old village, all around wonderfully decorated with flowers, absolutely worth visiting. We already knew then we’d be back on Friday, this day was meant only for a short pee stop and a little shopping. In a souvenir shop, I found a pretty little bagpipe in my “Black Watch” tartan at 30 pounds that I would have liked to buy because it was described as “playable”. I thought that meant I could play on it to make music, but it was meant to play with it and make noise and so I kindly refused. Sporrans were available at about 300 pounds, so my husband will have to wait a little longer. 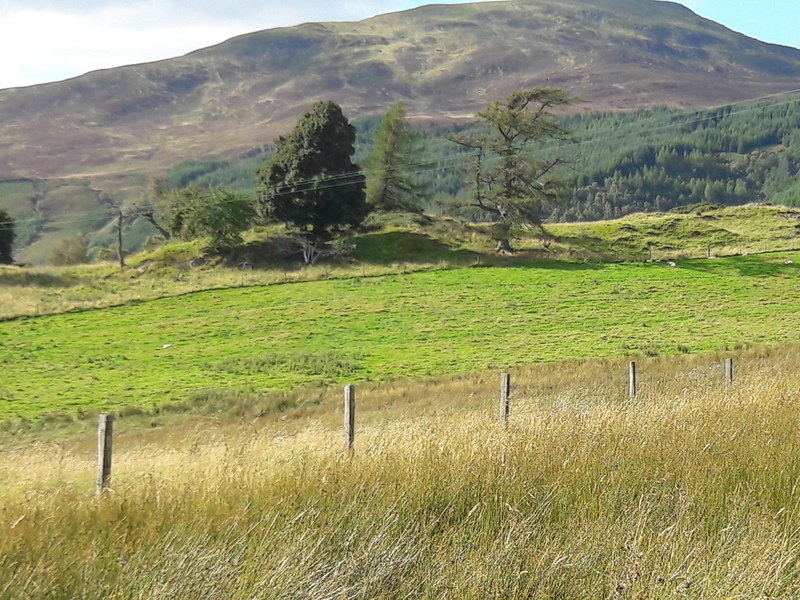 Our ride went on northbound to Culloden Moor. 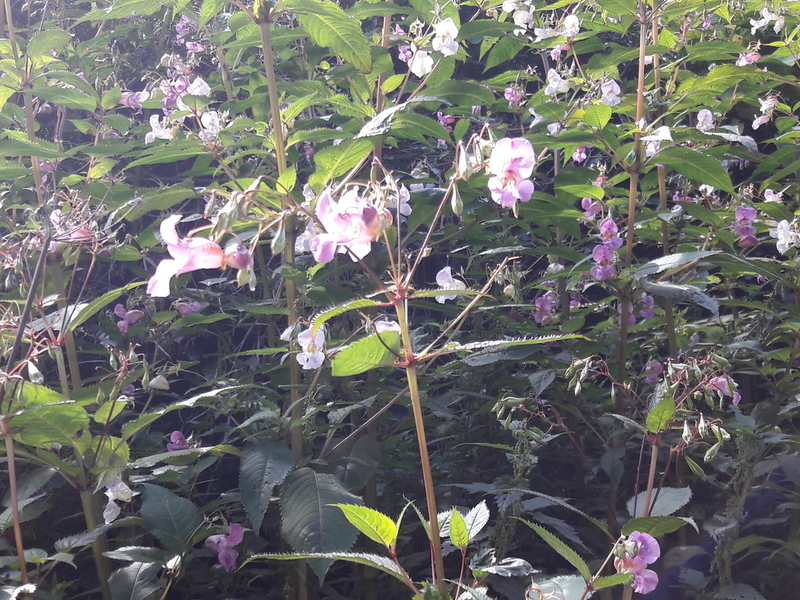 The day was mostly sunny, with only a few small showers. Please apologize if some of the pictures show some reflection, I couldn’t avoid it when shooting through the bus window. 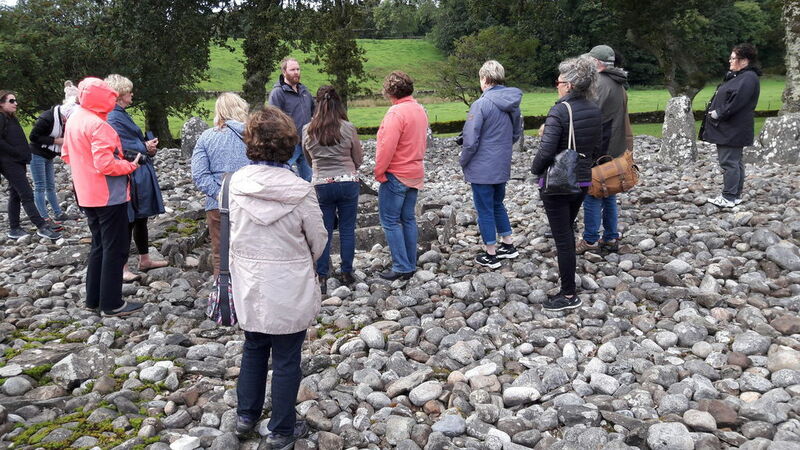 Catriona and colleagues explained on a tour over the battlefield that the Jacobite war actually was no war Scotland versus England since there had been Scots fighting on both sides, depending on their conviction. It was rather a war Protestants versus Catholics although not even this was consistent. Primarily was it about the question whom they considered to be the rightful king. 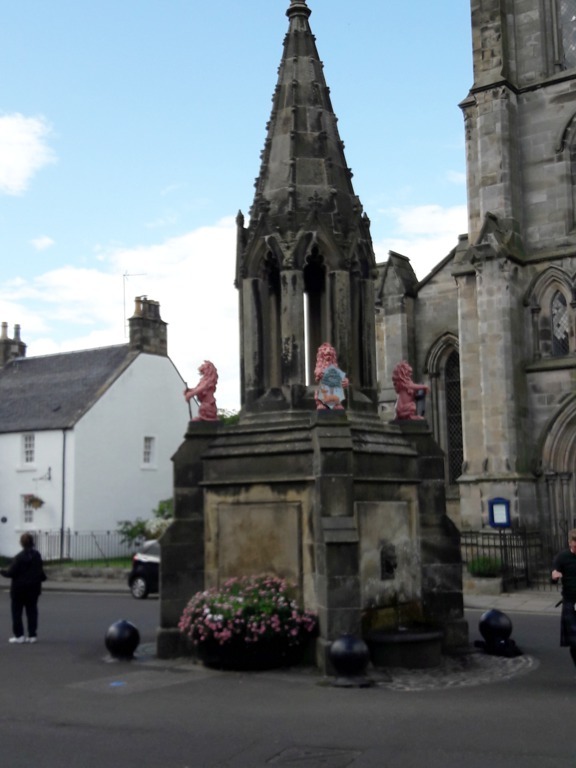 The Catholics/Highland Scots wanted to put their king James on the throne whose grandfather had been dismissed on 1715, while the Hanoverian supporters wanted to keep their protestant King George (from German ancestry). 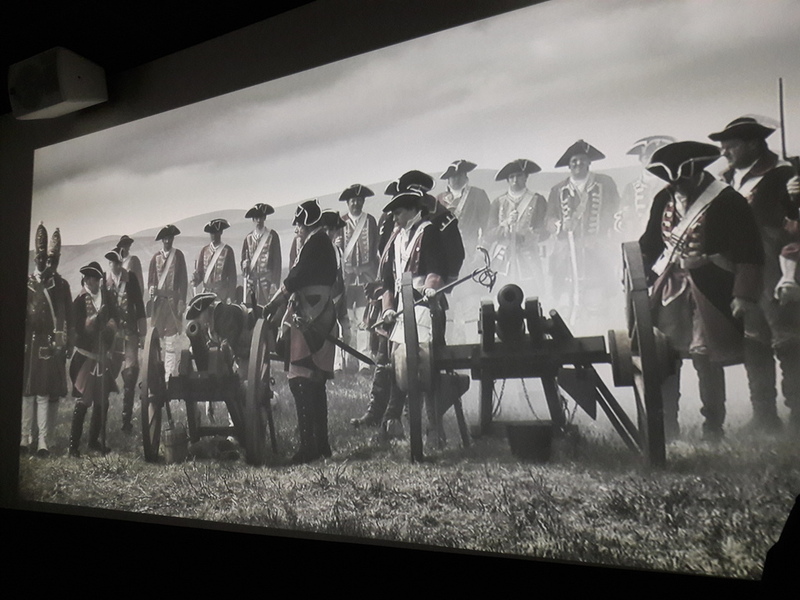 After the battle of Culloden, the Scots were killed systematically, the Duke of Cumberland ordered there would be no mercy on traitors, even those who tried to get home were prosecuted and killed, no matter what age. Even a man, verifiably sitting in jail during the battle, was hanged and his body mutilated. Houses were plundered systematically, fields or houses put on fire, men killed without reason or proof, the survivors, mostly women and children, starved to death. The Highland culture was banned, tartans, bagpipes and weapons forbidden. The culture had already been supressed by former kings since 1603, now it was mandatory for each noble man to send his first son to London for education. Gaelic was considered an unworthy language and systematically wiped out. History was written by the English, one-sided and to their advantage. 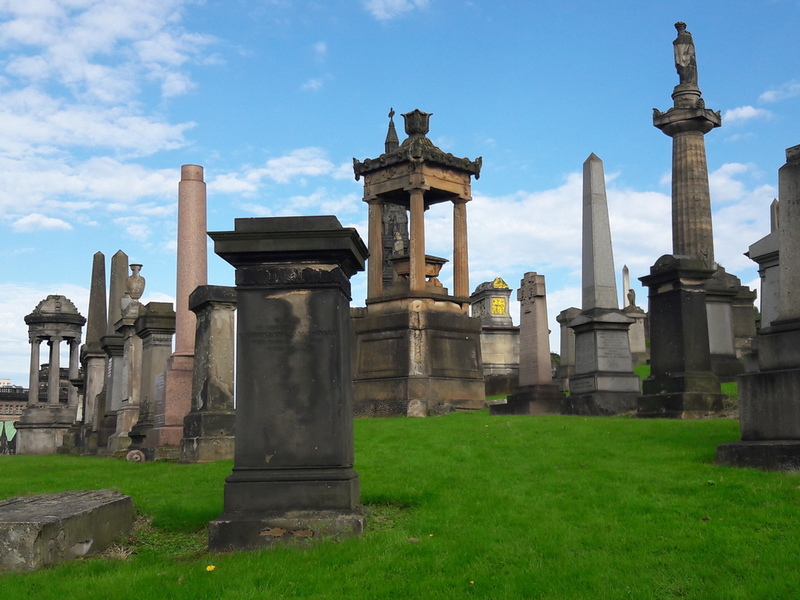 All this was very impressive, the many stones representing the clans involved, however the dead are not buried there, the stones have only been erected there in the early 20th century to memorize the fallen. It was a lightly sunny, but very windy day and even though I was warm dressed, I froze more on that afternoon than on any other day of our tour. 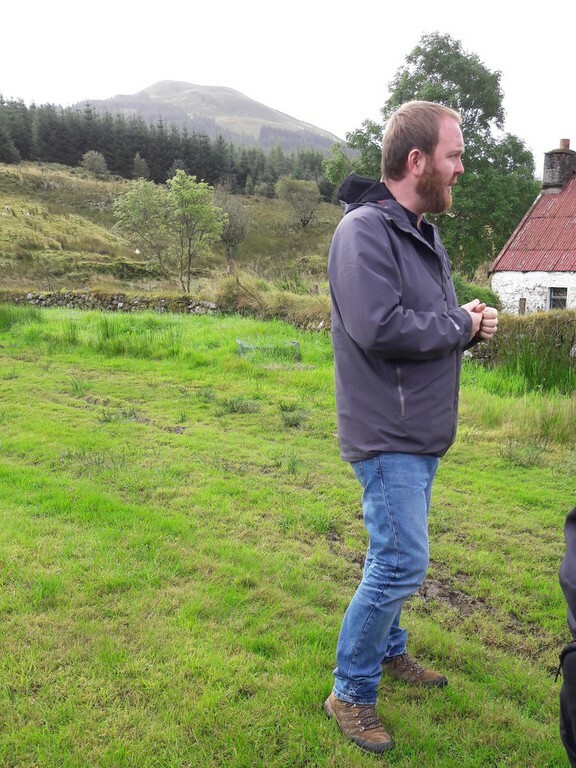 On our way back to the visitor centre, we came by the small cottage that absolutely looked like the one that we imagined form the books and TV to be the place where Jamie and the other wounded Highlanders took refuge after the battle. 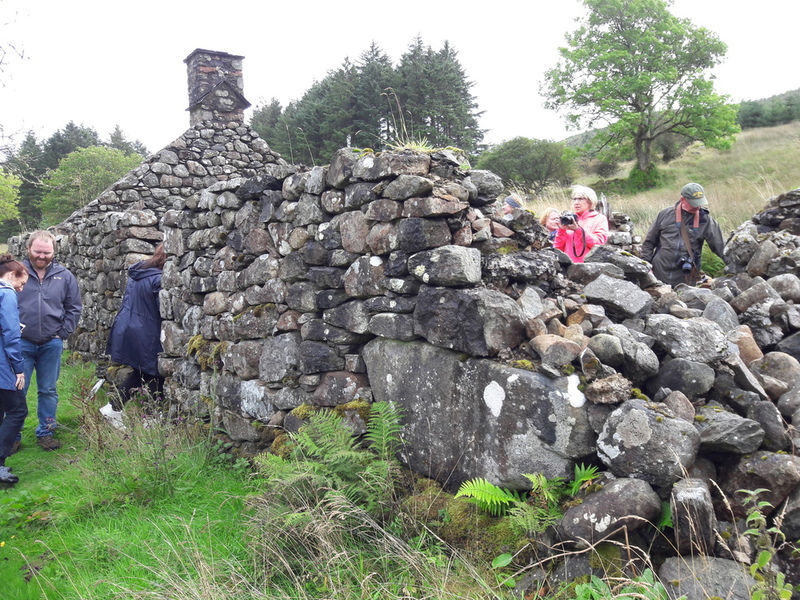 We don’t know whether Diana Gabaldon knew about this cottage before she wrote her third book, but it fits in astonishingly to the fiction. 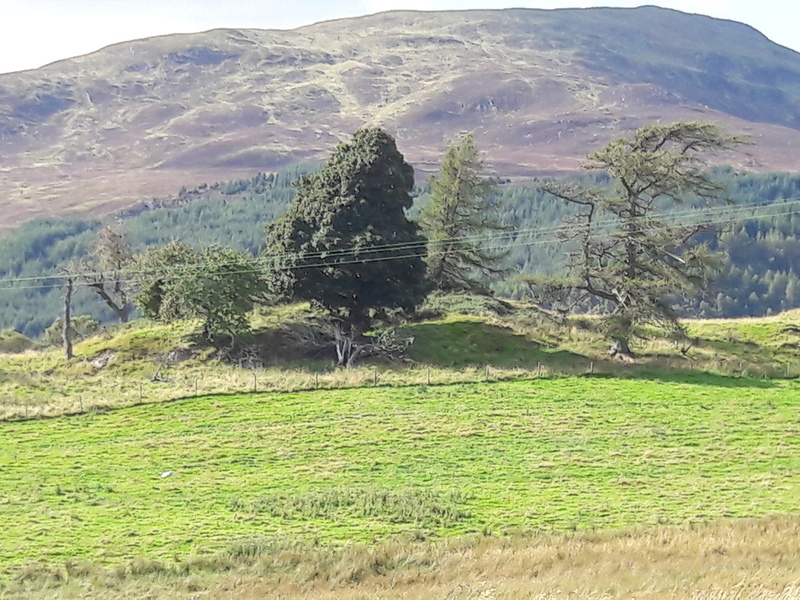 Next to Culloden Moor, just about 1 mile to the east, there is Clava Cairns, an old memorial place with authentic standing stones. Since I had already been there two years ago and remembered the small and narrow road leading there, of a kind to be just large enough for two cars carefully passing each other, I didn’t think it was possible for a bus to get there, but I had underestimated our bus driver. Our tour continued through modern Inverness, but there was not much interesting to be seen, and along Loch Ness southbound. Unfortunately, we were too late to visit Urquhart Castle on the shores of the loch, so our driver just stopped on a small space next to the road and we climbed out for some photos. We had a view from really a big distance onto the castle lying on a tongue into Loch Ness, we couldn’t get a closer look. Not bad for me, I had been visiting the year before (please see tour 2016), but really sad for the others. Now we started our long way south, leading us through the majestic valley of Glencoe (Glen = valley) while Catriona told us the sad story about the massacre of Glencoe. In 1690, Scottish Jacobite clans had lost a decisive battle and King William would grant an act of grace if they swore fealty until January 1st, 1692. 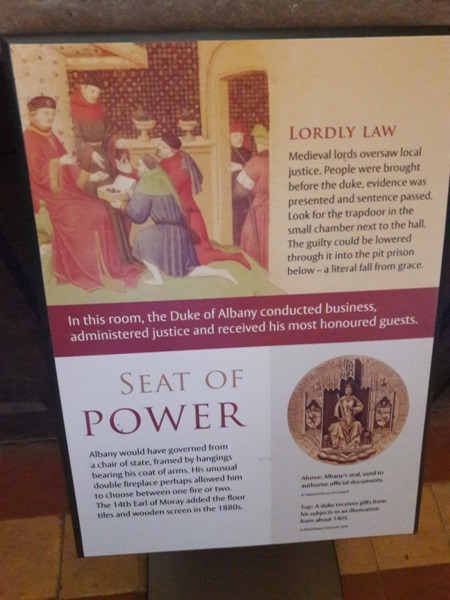 For quite a long time, there was a disagreement among the Scots whether they should give their oath or not, many of them stilled hoped for their dismissed King James who allowed them – rather late – to give the oath. 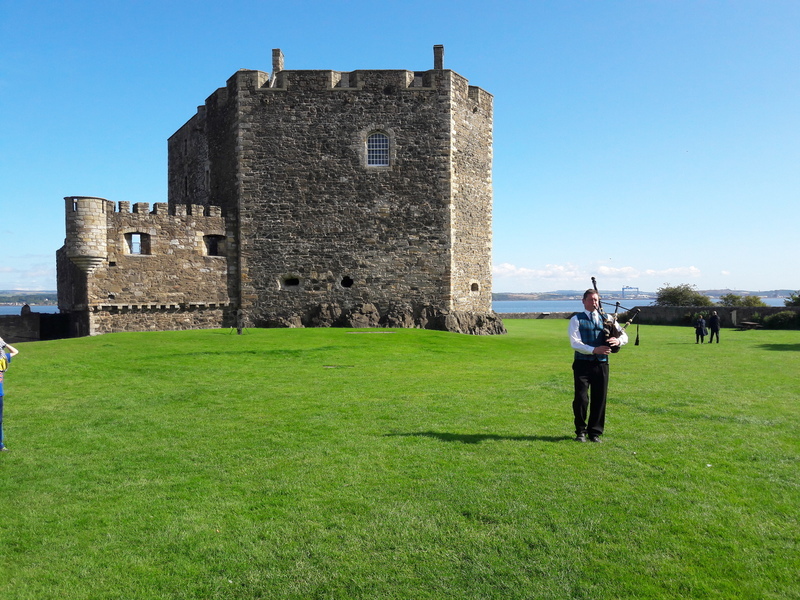 The clan chief of Clan MacDonald waited to the very last day until he decided to give his oath, but he didn’t make it in time to Fort William, because of the bad weather, he found the responsible sheriff in Inveraray too late, but eventually, his oath was accepted. While he now considered everything to be all right, his enemies and the government started an intrigue against him, and eventually, the king signed the order, they wanted to make an example of him. 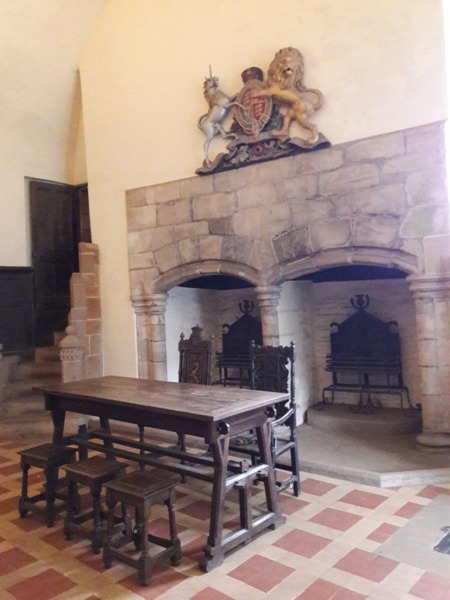 Some weeks later, still in cold winter, about 120 men under the order of the Campbell, Earl of Argyll, came to Glencoe as guests into the houses, got food and shelter. They stayed for a few days, until they got the order that they executed. They had dinner with their hosts, got to bed, only to stand up in the middle of the night, killed many villagers instantly, those who fled mostly died in deep snow. Their houses were burnt, only very few survived. Until today, this massacre is considered a shameful blot in the history of the Campbells and often, the relationship to the MacDonalds is complicated. There are only a few ruins left of the village, at the entrance to the valley. Until today, there are many songs about this tragedy. We stopped in the middle of the valley on a view point and left the bus to enjoy the beauty and majesty of the mountains. Not so beautiful were the masses of gnats, jumping on us when we got out, but even that couldn’t change the majestic mood. Pictures just cannot be just to the impressions and the mountains are just too big to catch them on photographs. But please, look yourself. 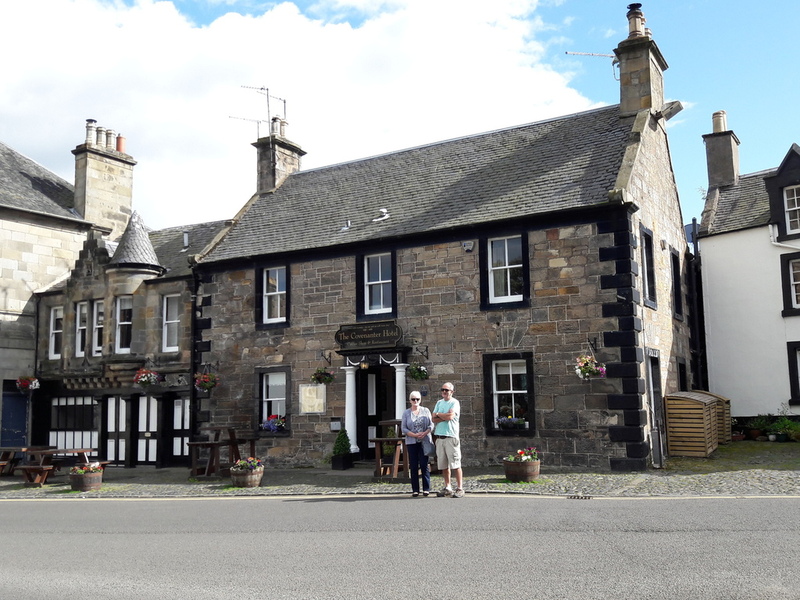 and finally, we reached the famous Drover’s Inn, an old coaching inn on the former main route into the Highlands, built in 1705. 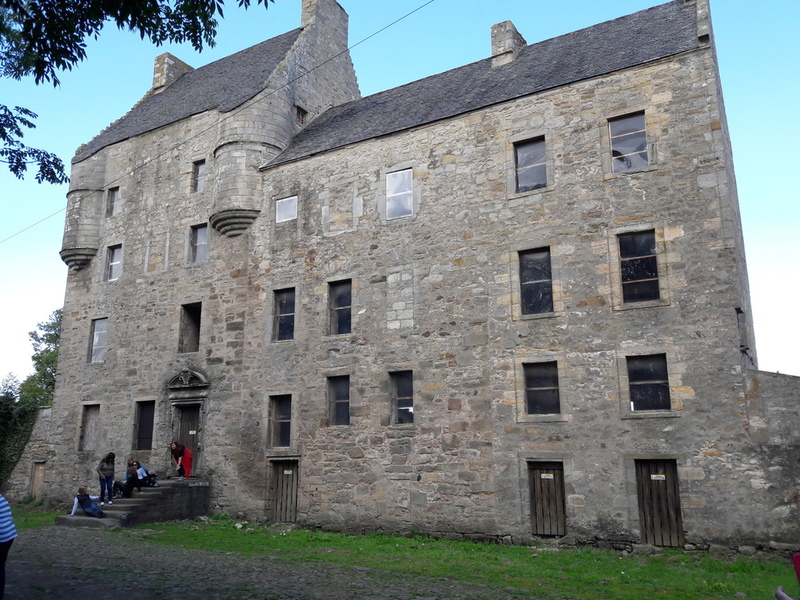 If I’m not completely wrong, the outside of the building was used for the inn in episode 109 The Reckoning, where Jamie, Claire and their men stay for the night after they freed Claire from Fort William (and where Claire gets her spanking). We left our bus in the backyard and entered the house. For people like me who knew nothing about this building, it was a big surprise to see all this dark half-timber and wood and these many dozens of stuffed animals of all kinds, but for many guests from other continents, it was a middle-sized shock and it looked just like some of them thought how good old Europe would be, old and odd. 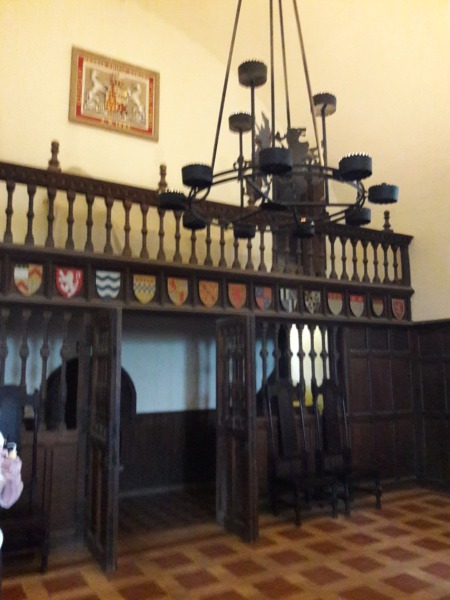 And there were not only the “usual” stuffed animals, but also a big bear standing upright (already pretty much worn from stroking), a crocodile as well as a real shark and a shark made from steel, both hanging from under the ceiling. Pretty fast, we chose our diner and ordered our drinks at the bar. 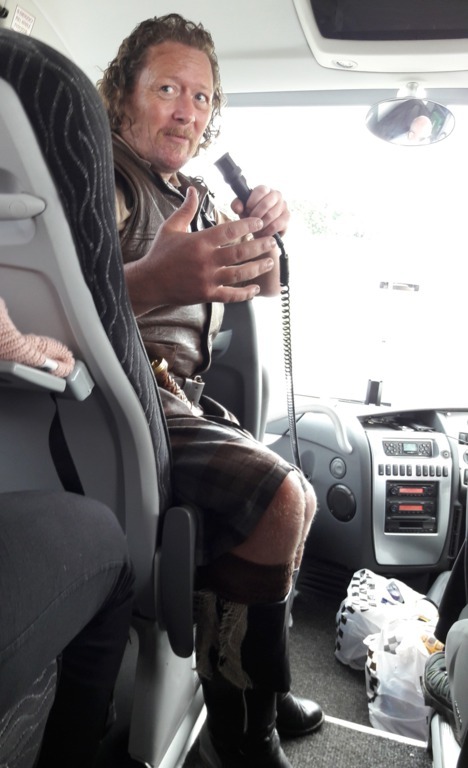 While we were waiting, the landlord – properly dressed in a kilt – entertained us with stories form and about the Drover’s Inn. 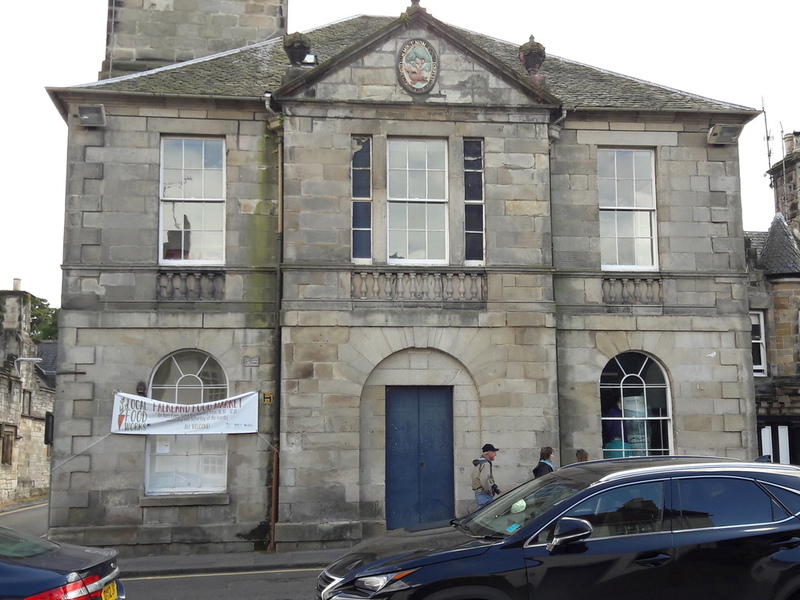 This building used to be a post station once, at a time when people couldn’t make more than 10-20 miles a day for the reason of bad roads, so there was a close chain of inns along the road to the Highlands. But during its long history, it wasn’t always an inn, other people owned it and lived in it, too. Some hundred years ago, there was a family hiking in the near mountains, their young daughter fell badly and they brought her to the Drover’s Inn where she died, tragically. Since then, she used to show her presence, not as a bad ghost, but for example by a caressing on someone’s arm, or she would fill an empty bath tub, the owners would empty it and when they came back, it was full again. Maybe just bad plumbing, who knows? All these ghost stories, let them be true or not, can be read on the website of the inn, so actually, every visitor and guest can be warned before, whether he believes in it or not, some even would come because of the ghost stories. A while ago, there was also a young couple who wanted to spend their first anniversary in one of the spooky rooms, but they hysterically rushed out in the middle of the night, afterwards, sent an angry email to complain and the landlord just asked them drily if he might use this email as recommendation and the answer was – no! These many stuffed animals could also tell lots of stories; nowadays, anyway, every guest can bring one or send one in that they can’t use in their homes to contribute to the interior of the inn. By far the strangest inhabitant of the inn is Old George, a dotty, regular guest to the inn who ordered his urn to be displayed by the bar and one day, there was a guy who tried to steal the urn, they just could get hold of him and save the urn before he left. Since then, the urn has been standing behind the copy of a Rembrandt painting in the corner. We had a really very delicious dinner, the entertainment was even better, and when we finally started for our way home, we were in best mood. 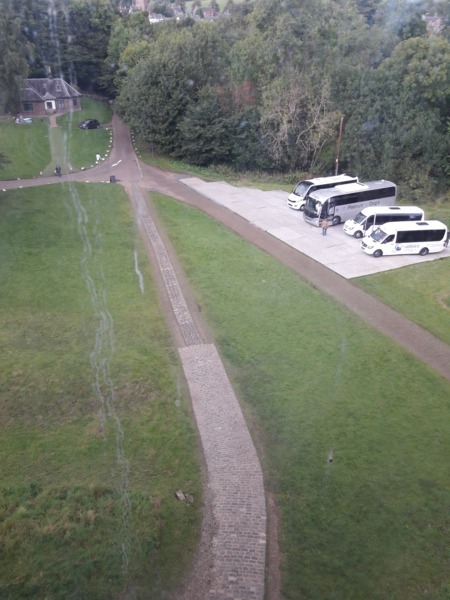 The road led us in many narrow windings along the Loch, our bus often needed the complete width of the road and when there were 2 lorries coming up, it got really tricky, the drivers proceeded by inches, the second lorry even clapped his mirror in and eventually we reached Glasgow safe and sound, late in the night. 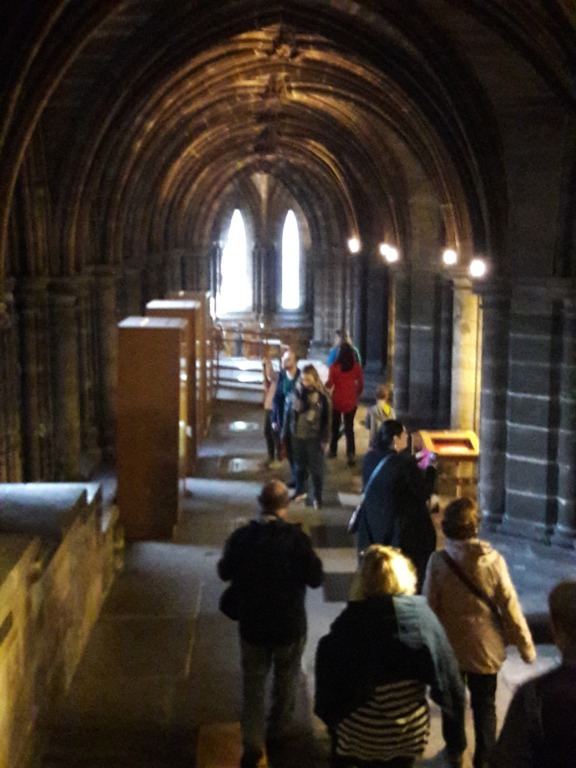 It took more than the expected 5 minutes until everybody taken had his/her pictures, then we proceeded on the motorway, passing Stirling Castle, the Wallace Monument and the Kelpies (please see also tour 2016) to our first stop of the day, Blackness Castle. This is lying on the Firth of Forth, the wide mouthing of the river Forth, you also could say it was located by the sea, I’m unable to say where the border is. 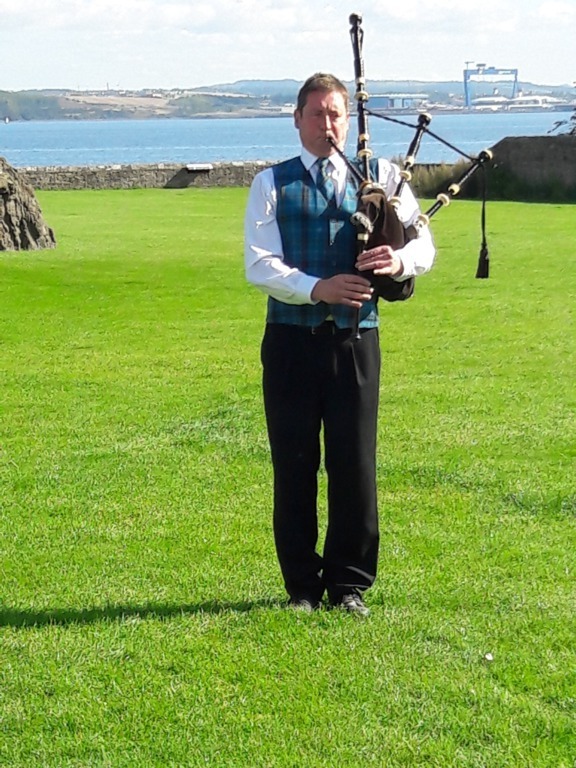 When we left the bus, there was a lonely bagpipes player standing in front of the castle, in a beautiful dress, playing the Outlander theme Skye Boat song. 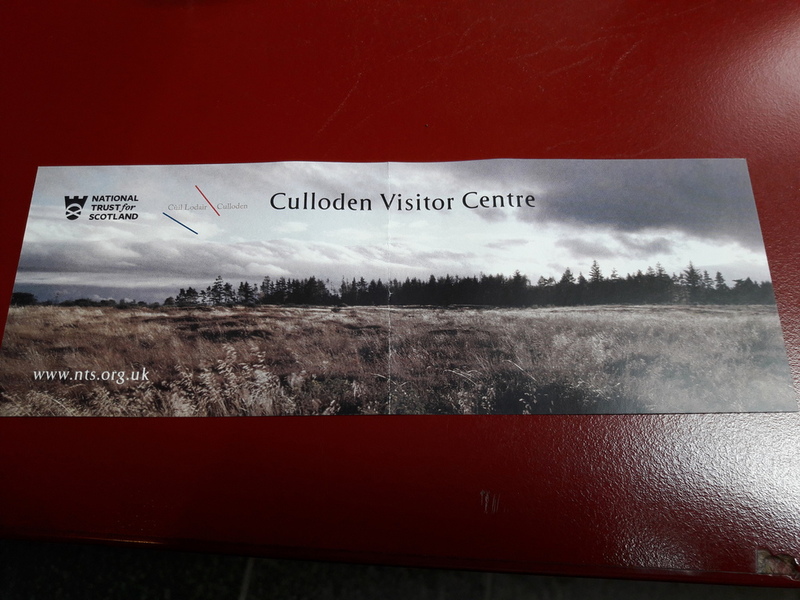 Catriona picked up our tickets, then gave us a historic summary on this place. 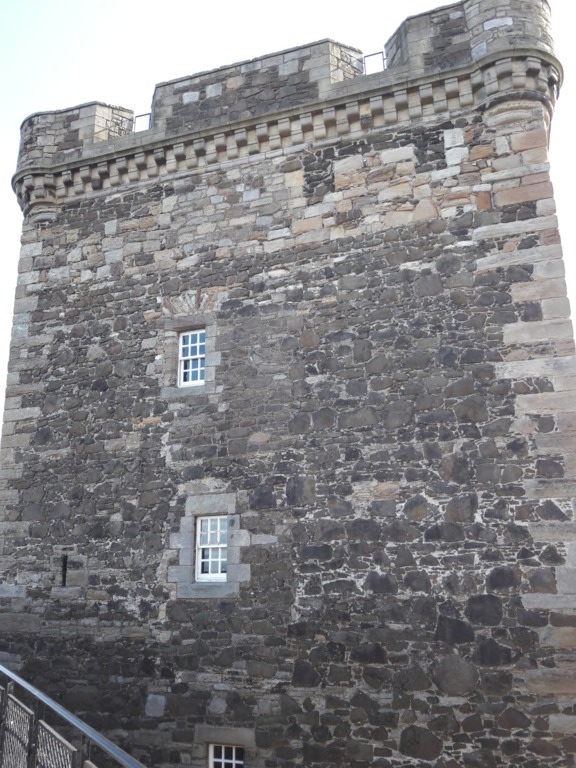 The castle once was built to protect the royal castle in Linlithgow, located a few miles further inland. Because of its unusual form, reminding of a ship from above and because of its location next to the water, they call it mockingly “the ship that never sailed”. The castle was never conquered thanks to not only its thick walls, but also the many turns and corners on the way inside, it was just impossible to position a ram or something like that. But this had also the effect that the production had to lift in all the bigger parts by a crane (and out again, I’d say). 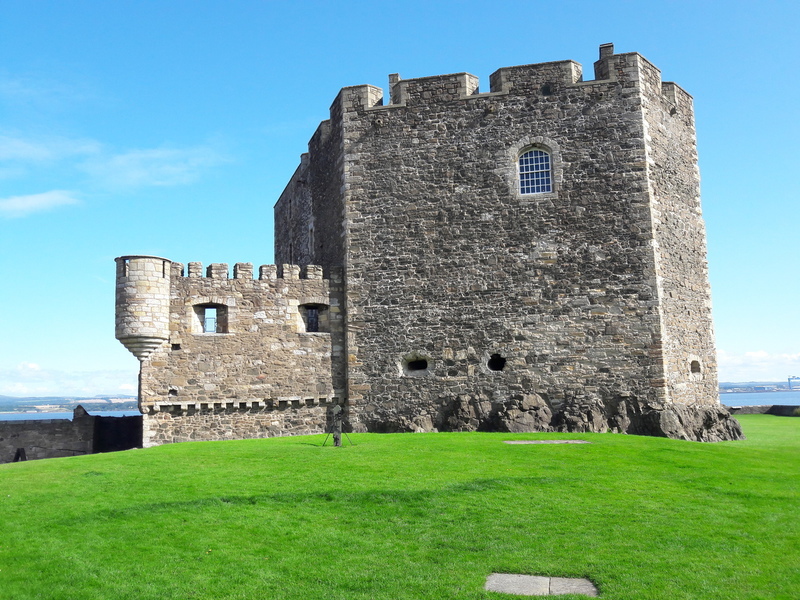 Catriona had another ghost story for us about this castle. One winter’s day, she came there with an only tourist and they climbed up the tower (in the middle of the courtyard). 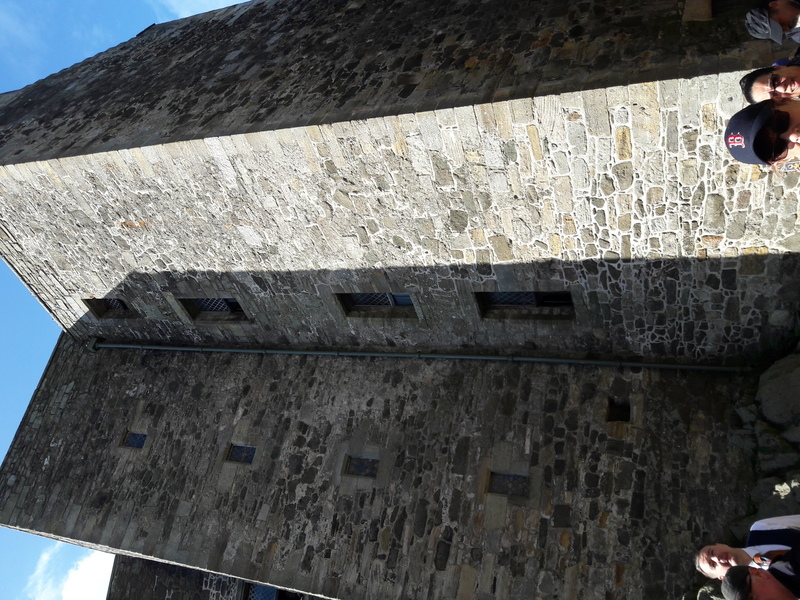 While they were on the first floor, they heard steps from above, but when they got up, there was nobody and everywhere where they looked, there was nobody, they were all alone in the tower. 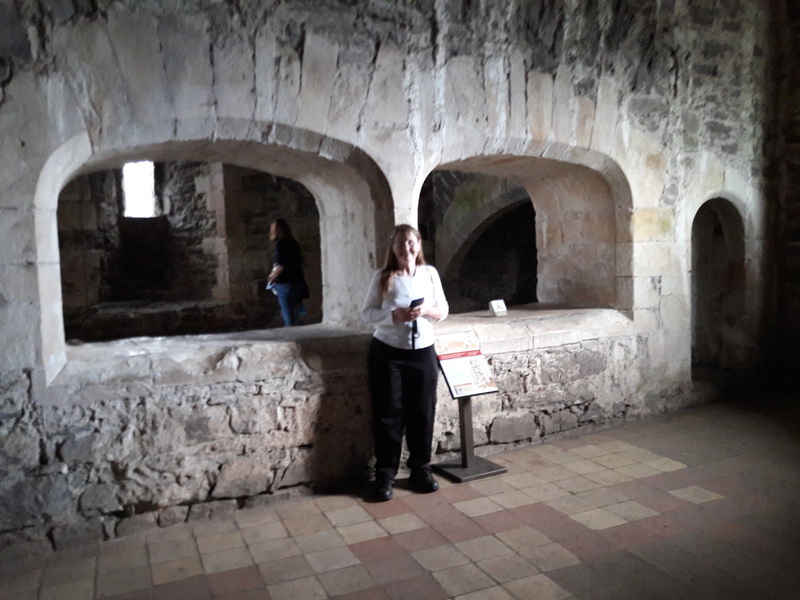 When she came home, Catriona looked it up and in fact, there is a book with documented ghost appearances and the tower of this castle was reported as a ghost site, particularly with footsteps in the tower. The building opposite to the castle, to our left side, was built later for the officers who didn’t want to sleep in the spooky castle anymore, they left this to the common soldiers. 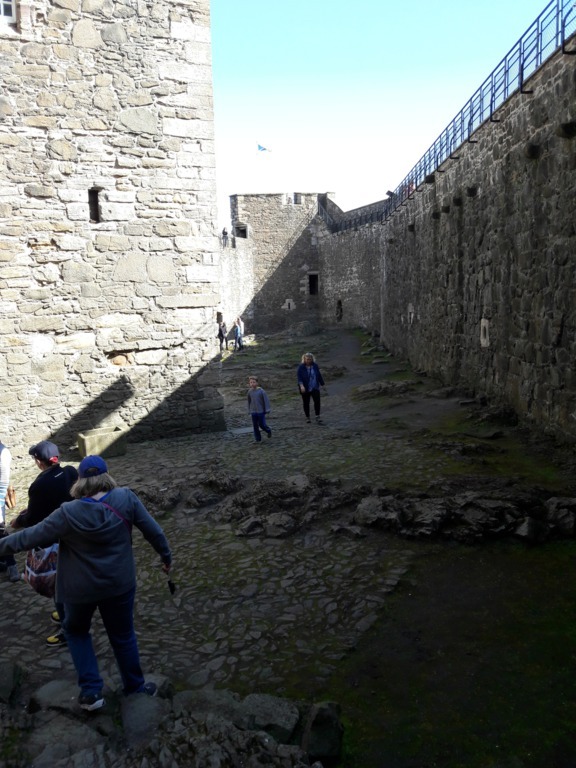 We entered the castle and looked around on our own, the very first place we saw when we went in was in the right corner at the left turn, this is the place where Jamie and Murtagh threatened the English soldier to tell them where Claire was held captive. 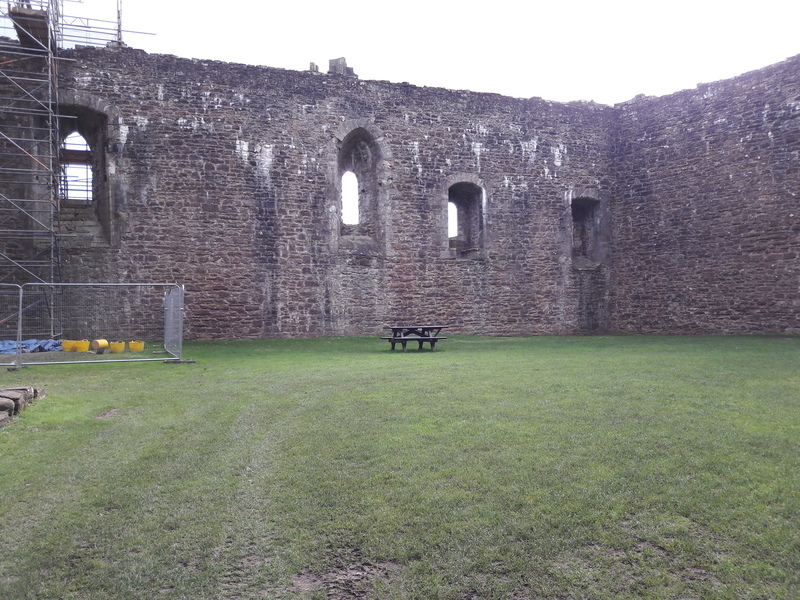 In the courtyard, in the very left corner, was the place where the post stood, where Captain Randall whipped Jamie and which Brianna gave a chill. 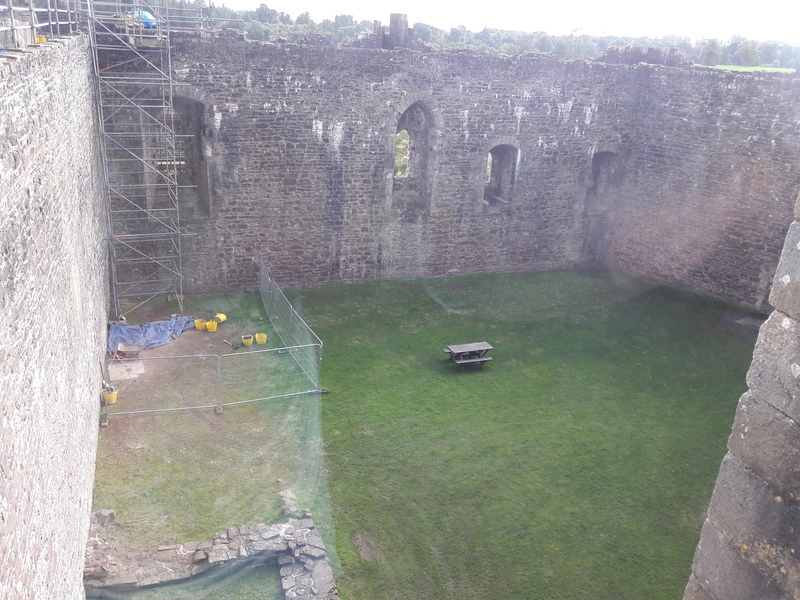 From the tower window, Jamie let himself down on a rope and from the wall to the sea, Jamie and Claire jumped down (although, in reality, there is no water below, there would have been a big air cushion). This old castle was just a wonderful place for shooting! 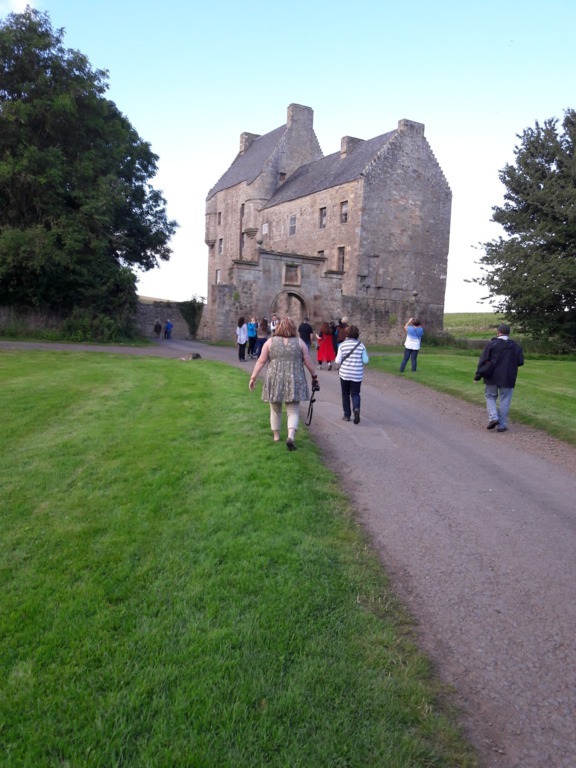 Now we came to a place which would be for many of our group the absolute highlight of the day, maybe of the hole tour – “Lallybroch” Midhope Castle, home seat of the Frasers. Catriona warned us before we arrived, that although we had booked and paid tickets, the behaviour of the owners or the administration had been difficult recently and they might refuse our visit, but that she would go there with us in any case. Our bus couldn’t take the last small road to the site, to we left it at the last crossroads, in the middle of the forest which was practically in the middle of nowhere, somehow. We had to walk about 300 metres by foot, this was no problem. The small workshop on the ride side had grown since my last visit, now it’s a fireworks company, making sense, since there are no neighbours to be disturbed. This time, there were no pheasant to be seen like the previous times, but there was something new: While the access was free until spring 2017, now there is a small hut with an elderly man, a cashier, two exhibition boards and a sign demanding to behave well and not take photographs of the neighbours. All the others (except the actors) were visiting this place for the first time and they were absolutely entranced. 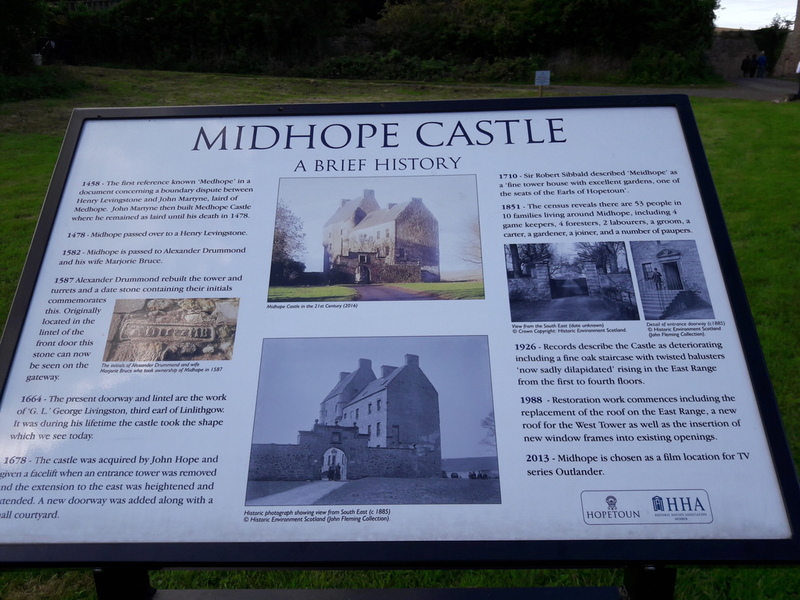 Actually, Midhope is not a real castle, looks more like an estate with a lateral archway. We took many pictures with us, Scott and Fraser (yes this really is his first name...) and he told us how the site was modified before shooting and afterwards by CGI. You will remember, on TV, it was inhabited and in best shape in 18th century. For the 20th century, the windows and wooden sheds in the window frames as well as the roof were eliminated, the stairs and the yard were jazzed up and a main door put in, but nobody could go through that door since the building inside is completely ruined, thus the door is blocked, nobody can go inside. They only make it look like in TV by cutting. Fraser explained that removing windows on a static object is quite easy, but it’s much more difficult when filmed from a driving car. Some of the Claire scenes (e.g. in the car moving) were shot with one of the two doubles they have. Once, this house was a piece of jewellery, there is a picture of its inside with a legendary double staircase on it in some museum. 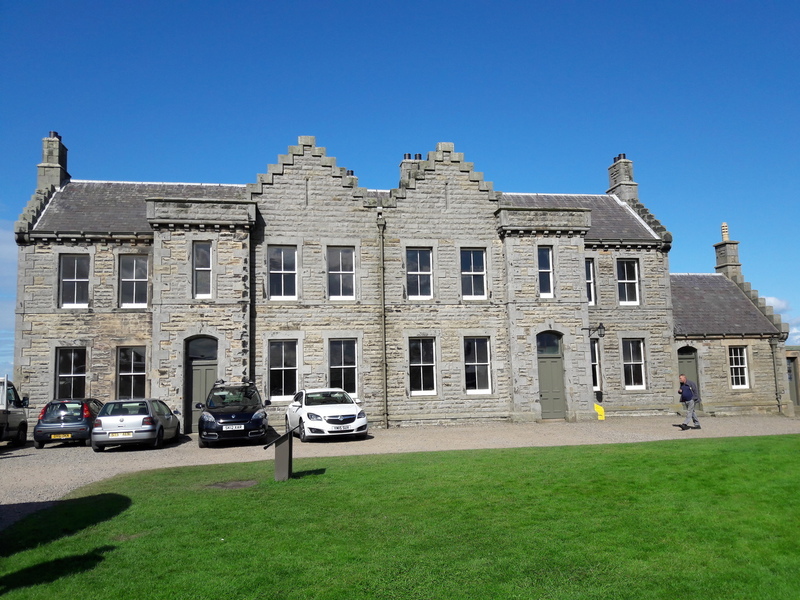 It was built in 13th century as home for a family of rich merchants and bankers named Hope, but at around 1690, they moved out to their new home, the nearby Hopetoun House and the building was used for their staff, gardeners, servants etc. There were a few families living there over the years, then the ownership changed several times, last person living there (without water and electricity!) was a single elderly lady who died in 1970, and since then, the building has been vacant and derelict. We took one last group photo and left the place, after more than one hour. 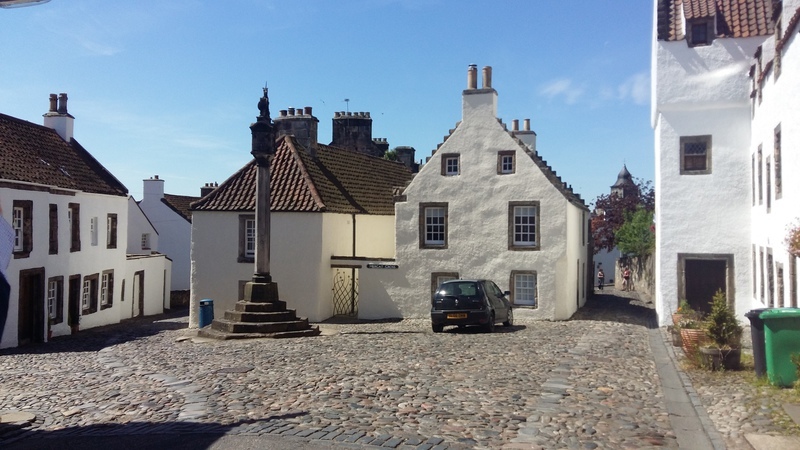 Next on our tour was Falkland, this wonderfully preserved Scottish village, standing in the series for Inverness (because there’s absolutely nothing in modern Inverness looking like that). 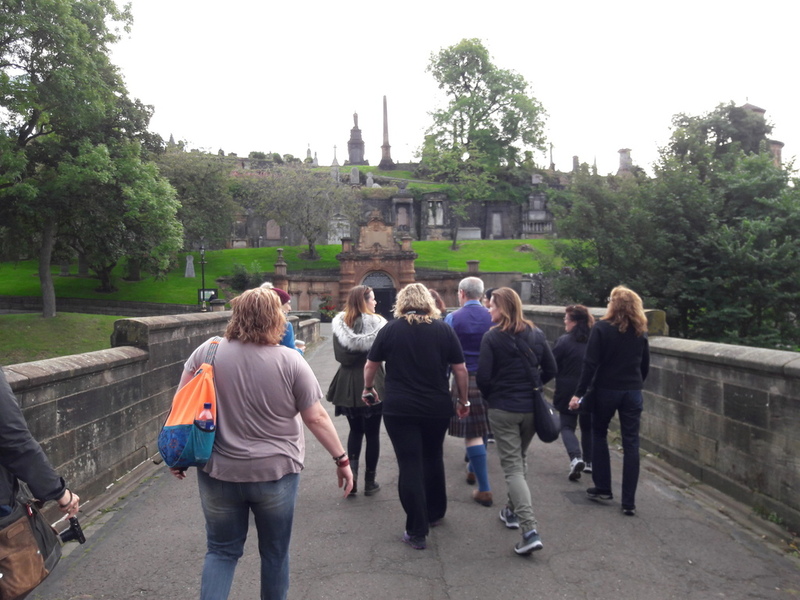 Falkland lies on the other side of the Forth, so we had to use the bridge at Edinburgh and we were thrilled when we saw that the new Queensferry Bridge was open for just a few days! Catriona mentioned she had been waiting for this day for years. However, the bridge was closed again 2 days later and then opened by the Queen the following Monday in a big ceremony. 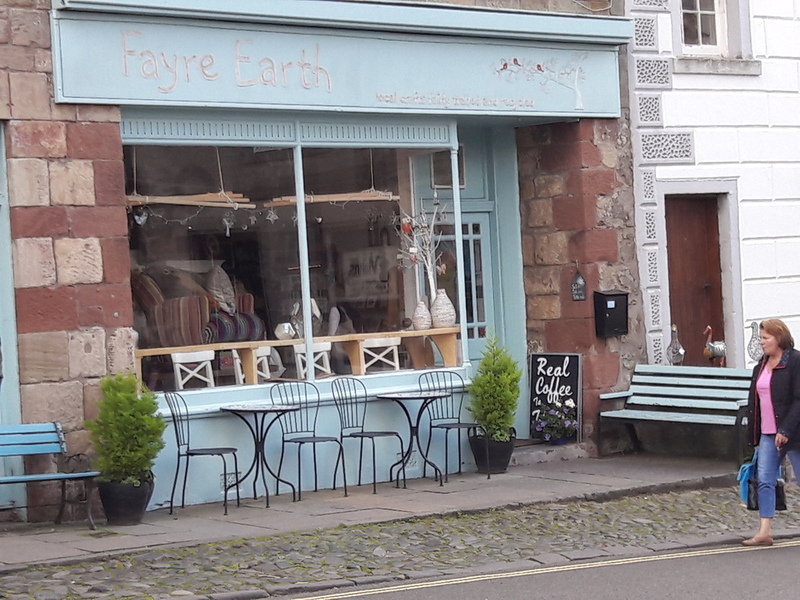 This was my 3rd visit to Falkland already, but each time had been beautiful to be there. 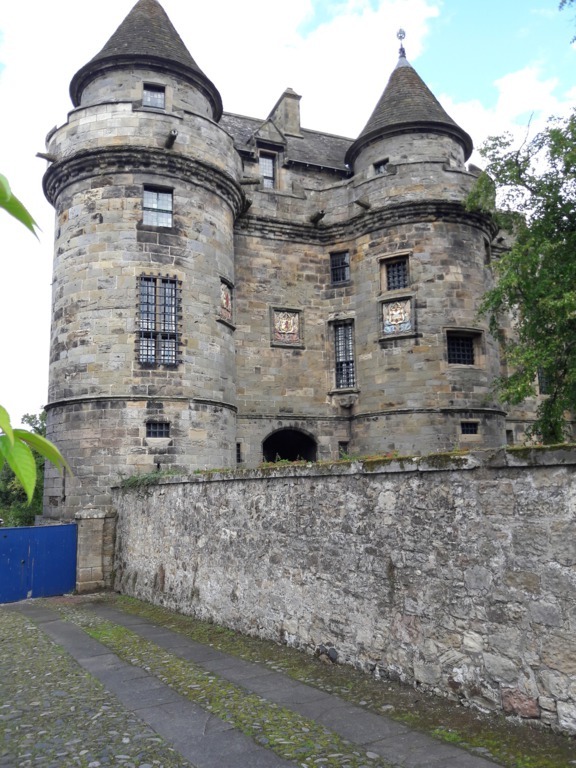 We left our bus in front of Falkland Palace (yes, there is a palace, too, and unfortunately, I heard only a few days later that there had been shooting in the palace for the apothecary in season 3), but we didn’t have time for this one to visit. 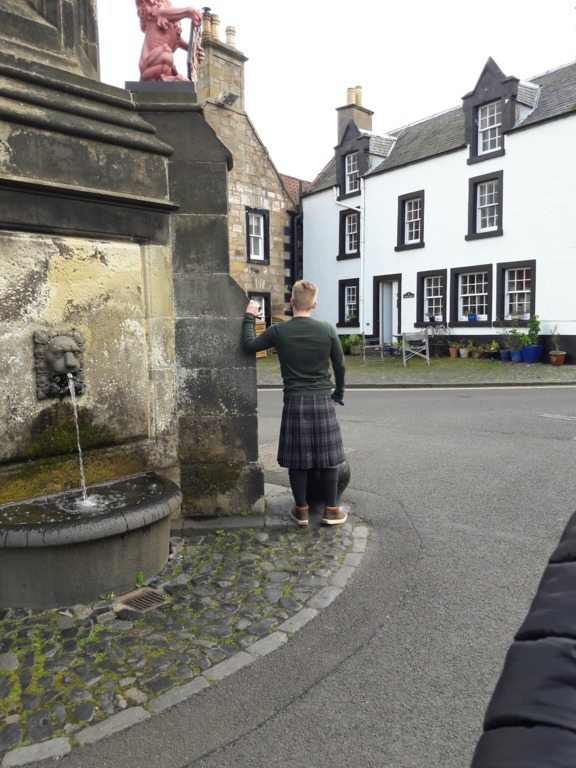 Enthusiastically, the girls took pictures of the fountain, many of them with Fraser in his kilt, representing the ghost in the very first episode. 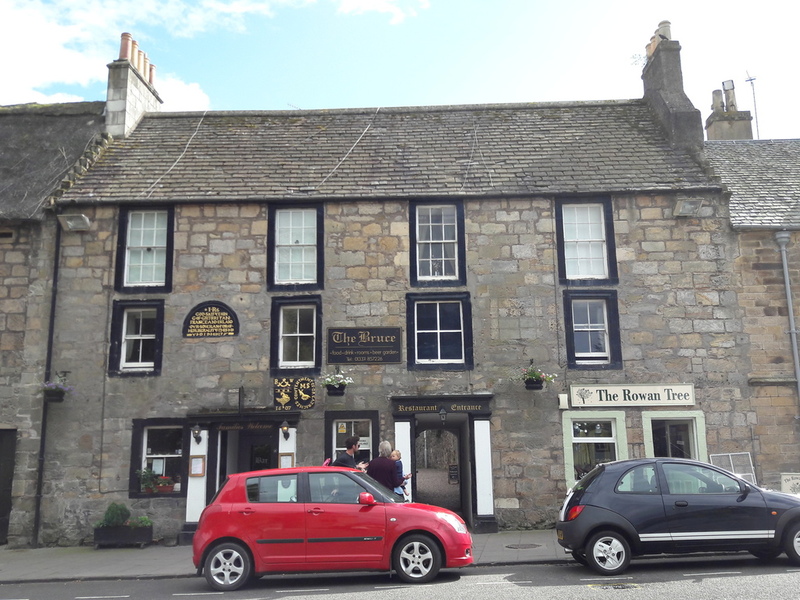 We saw the pub that stood for Mrs. Beard’s B&B and to its left, the City Hall where Claire did research on documents about Lallybroch. There was the shop that Claire stood in front of and I showed to Lynn the small lane that Claire walks through with Murtagh to visit Alexander Randall. 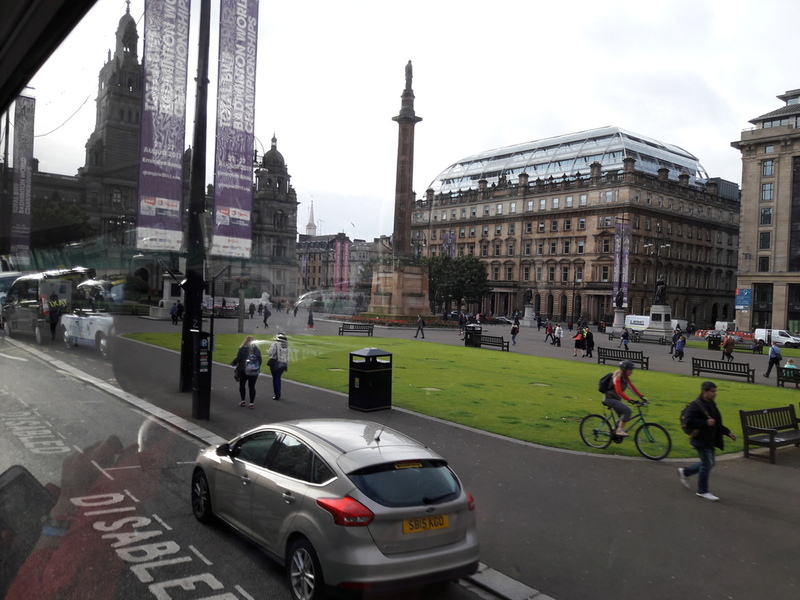 Catriona told us how she was here as an extra, standing and walking opposite the city hall in freezing cold winter, for a scene with Claire in the sixties. Some of us took a late lunch in the café or enjoyed the sun that indulged us on that day until we had to leave after about one hour. 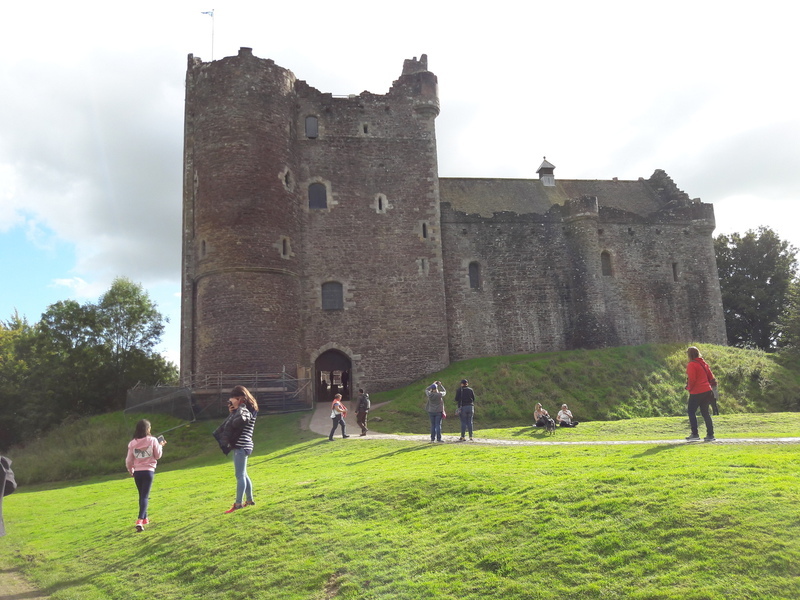 Now we had to hurry because we wanted to visit Caste Doune before it closed for the day. On our way, the main road was blocked and Catriona considered changing plans and postponing Doune to the next day, but then we found an alternative route. 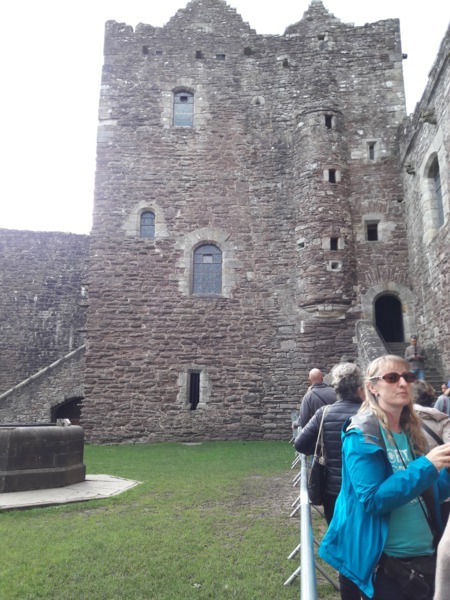 This castle also was very important to us since it stood in TV for Castle Leoch, ancestral site of the clan MacKenzie. 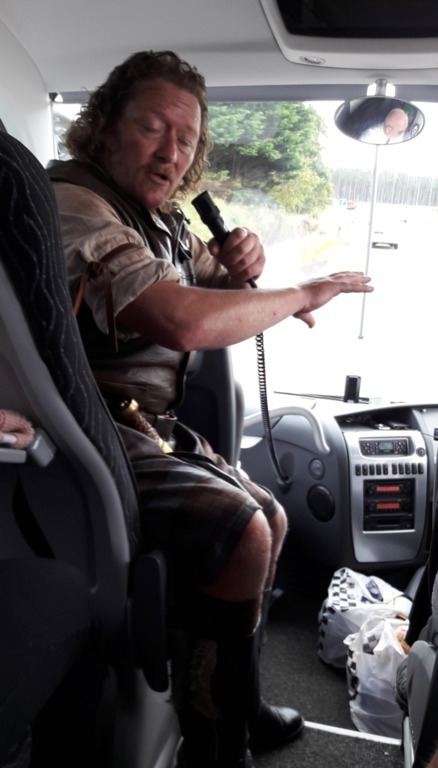 They didn’t have enough audio guides for everybody from our bus, so we shared them by two and Catriona explicitly advised the last 3 numbers on the audio guide which are spoken by Sam Heughan himself! 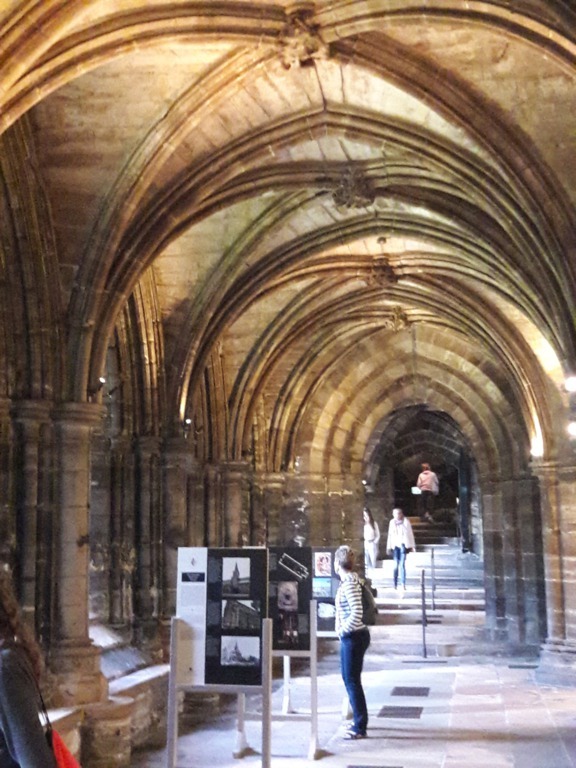 I shared mine with Lynn and we toured through the castle, it was not too big and could easily been visited within half an hour. We knew already the kitchen had completely been rebuilt 1:1 in the studios. There was a man from the Scottish Trust taking all measures in the kitchen for a plan he was creating. 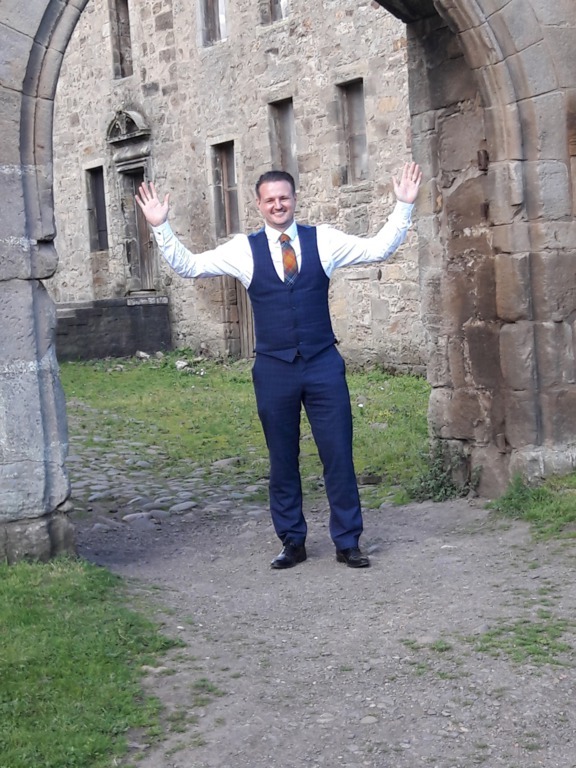 Should we have told him he just could call in Cumbernauld to ask the stage designers, they should be able to give him all the dimensions to the millimetre! 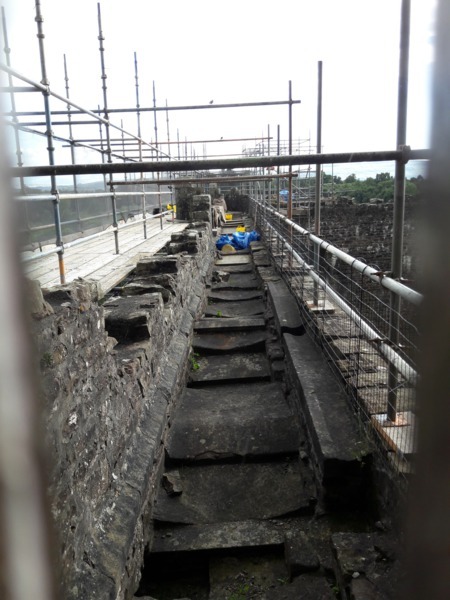 There were maintenance works in the castle and so, to the upper wall-walk, where from Claire had looked down from into the courtyard, we could only look out and photograph through an almost blocked window. For the shooting time 3 years ago, the courtyard was filled and covered with tons of soil and mud to look authentic. 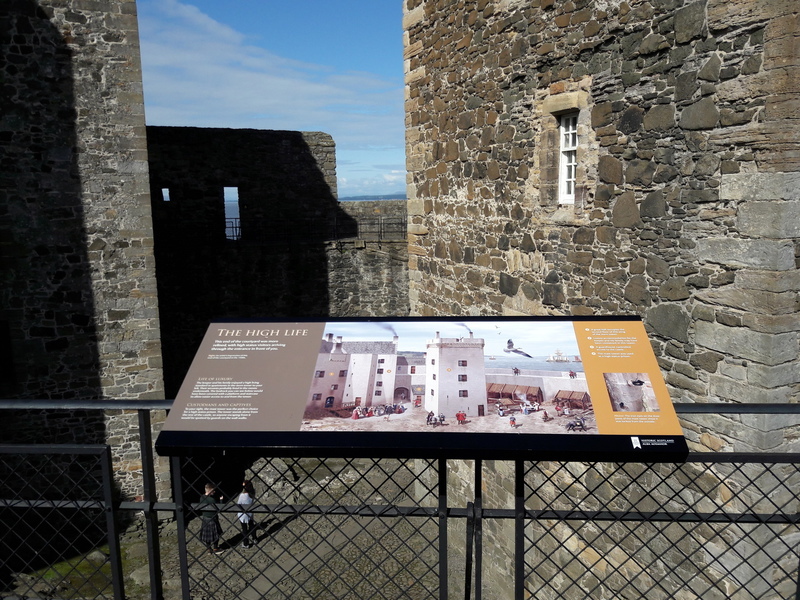 The castle closed at 5 p.m. and we drove further to Culross. 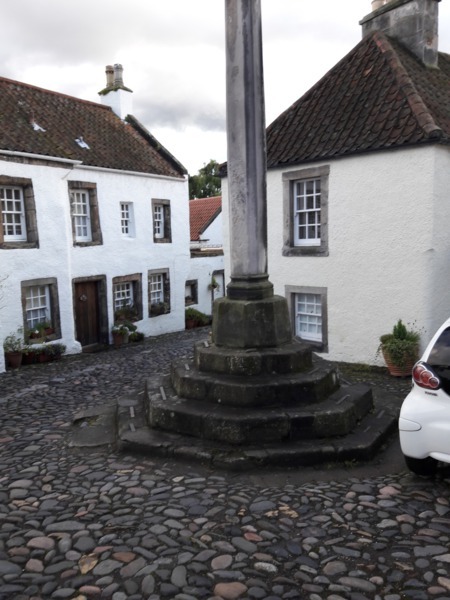 Culross is located on the northern shores of the Firth, just by the water and stood in TV for the village Cranesmuir near Castle Leoch. We left our bus just in city centre in front of the City Hall / souvenir shop and Catriona warned us to go in. Actually, she said we were free to go in, but we’d never get out again and would have no time for a visit anymore, the owner was a chatterbox. She led us through a narrow lane to the market place where we found a familiar place and houses. 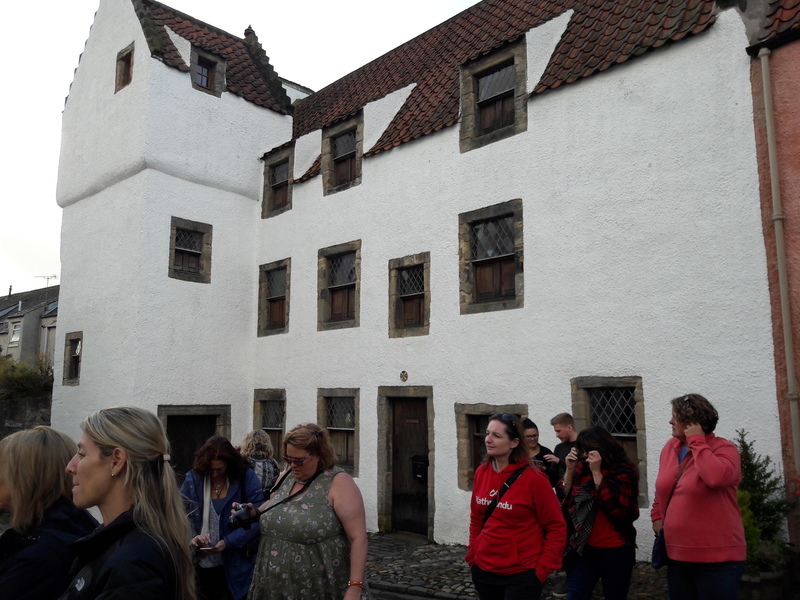 To our right, there was the house where Geillis Duncan lived, in the middle, the post where the ear of the boy was nailed to and to the left the house, where Claire healed little Thomas. 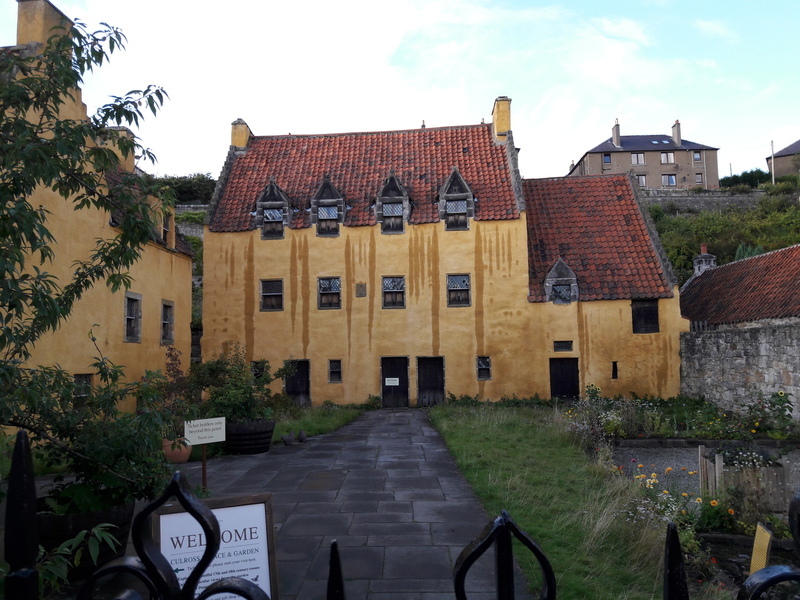 This small village of Culross is wonderfully preserved from old times, many roads have cobbled stones, there is a unique charm in it, also in the very special architecture and the old glass windows that we could find on several buildings, also on the Culross Palace (the yellow building), more looking like a little mansion than like a palace. Unfortunately, it was closed for the day and so were the terrace gardens behind the palace (where Claire met Geillis for the first time). We wanted at least to have a look on it from the gate. 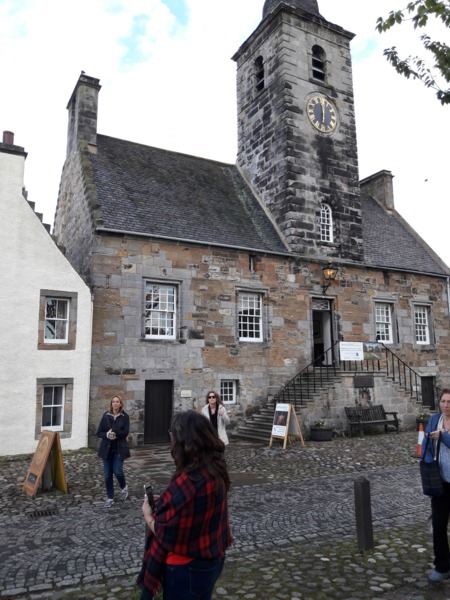 Scott and Fraser could tell us stories about the shooting in season 2, actually, we hadn’t known that the forecourt had been used for the episode Prestonpans. The production had rolled some carpet on it that looked like a cobbled lane and for the background, opposite the palace, where there is water in reality, they used a huge green screen. Fraser showed us a video on his cell phone that showed green background first that changed into historic CGI background. It was getting dark already and high time to go back to Glasgow. In Glasgow, I needed a taxi back to my hotel, as usual, and since there was none on the road to be found, I could use an easy opportunity that I had been shown on my very first evening: The Argyll Hotel has a device where I could easily call a taxi with a touch of a button, a few seconds later, there was a confirmation code on the display as soon as a driver accepted the tour. I only needed to go back to the road and wait for a few seconds. 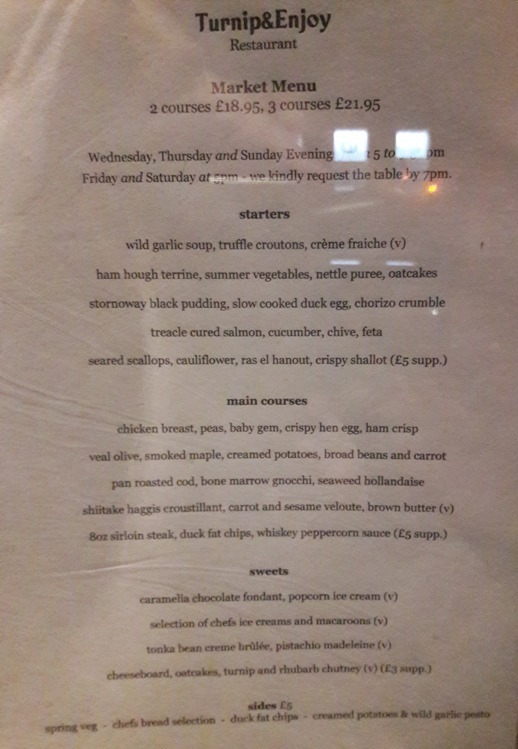 For dinner, I didn’t want to walk far and looked for restaurants on the Great Western Road (main road next to my hotel), where I had seen a few restaurants next to Tesco Express. 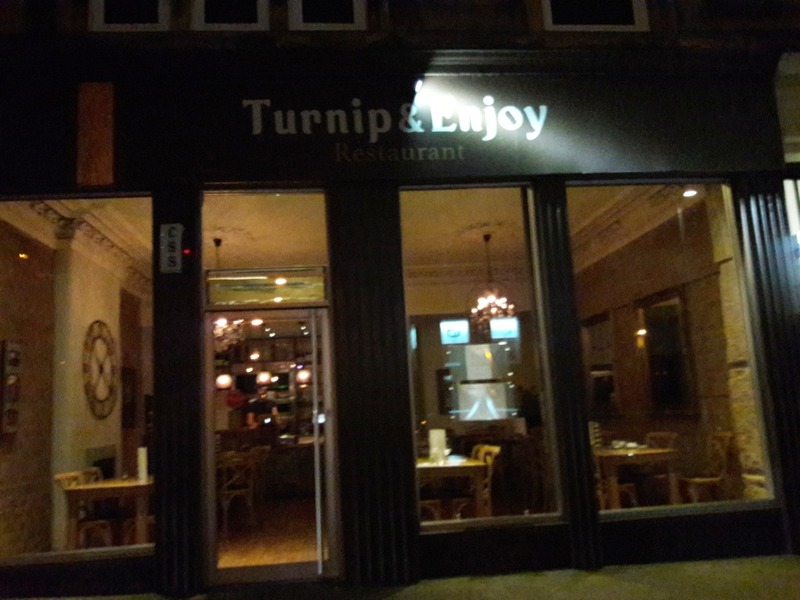 The Persian restaurant that had looked interesting the other day, was full and I chose a fine dining restaurant a few metres further, „Turnip & Enjoy“, offering menus with 2 and 3 courses and various dishes. 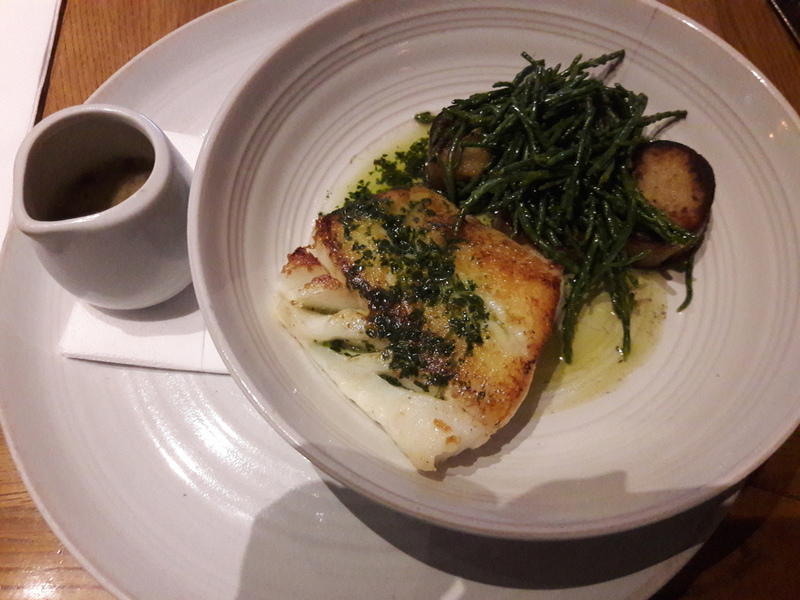 I had a soup with wild garlic and, along with a pot of tea with honey for my sore throat and as main dish, I had roasted cod with bone marrow gnocchi and seaweed and crème brulée for dessert. To be short, I had a wonderful dinner, the waiter was very attentive, I couldn’t understand why only 3 tables were occupied, possibly because of the not too cheap prices and because I had arrived quite late already, but anyway, I can highly recommend this restaurant without hesitating and will go there again next time I’m in Scotland. 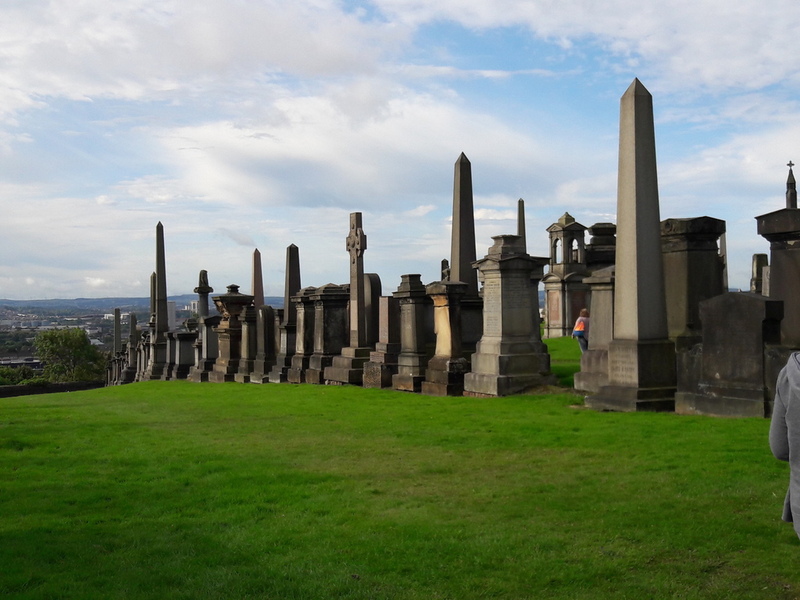 After departure from the Argyll Hotel, our first station was the Necropolis, the City of the Dead, which is the old, impressive cemetery town, located on a steep hill next to the Cathedral, just over a big bridge, a high place for the rich where they could look down upon the city and the poor and show off even after death. It was quite a climb upward, but worth the effort. 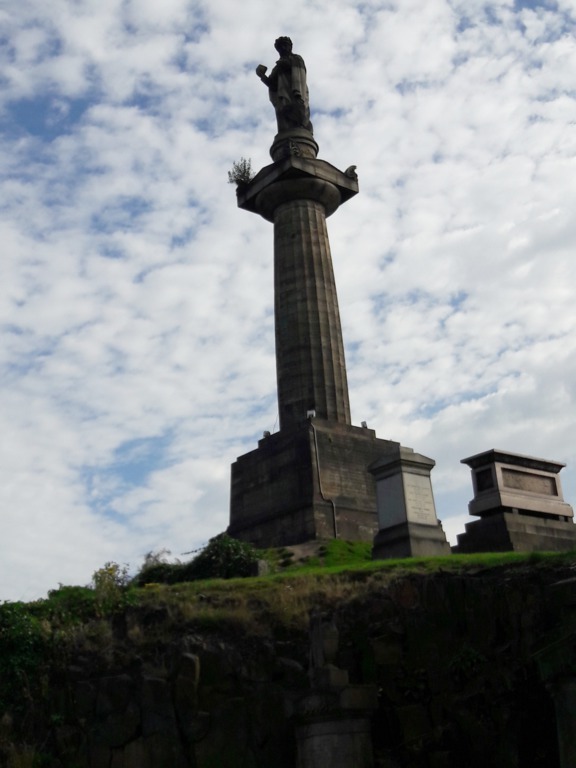 The biggest statue on top of the hill is for John Knox, the famous Scottish reformist, however he’s not buried there. 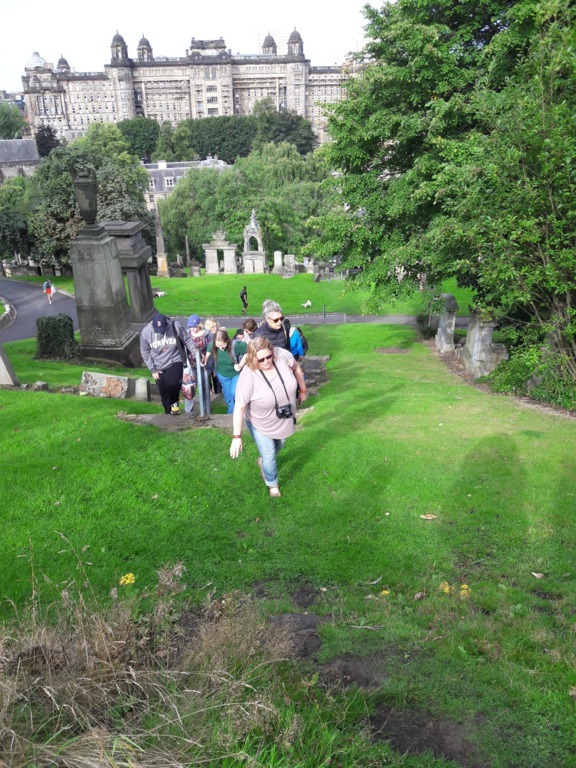 We learned a lot from Catriona about the history of Scottish reformation while we walked downhill in soft serpentines towards the cathedral. 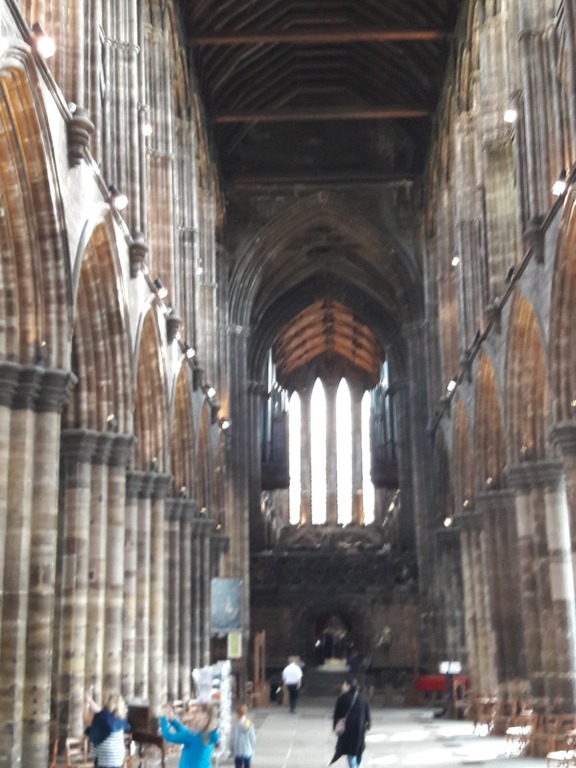 Glasgow St. Mungo’s Cathedral was built in 1200 for the education of catholic clergymen and has been an active Presbyterian church until today, so we were asked for good behaviour. Today, the cathedral is dedicated to nurses and we considered that quite appropriate since Claire was a nurse, too. 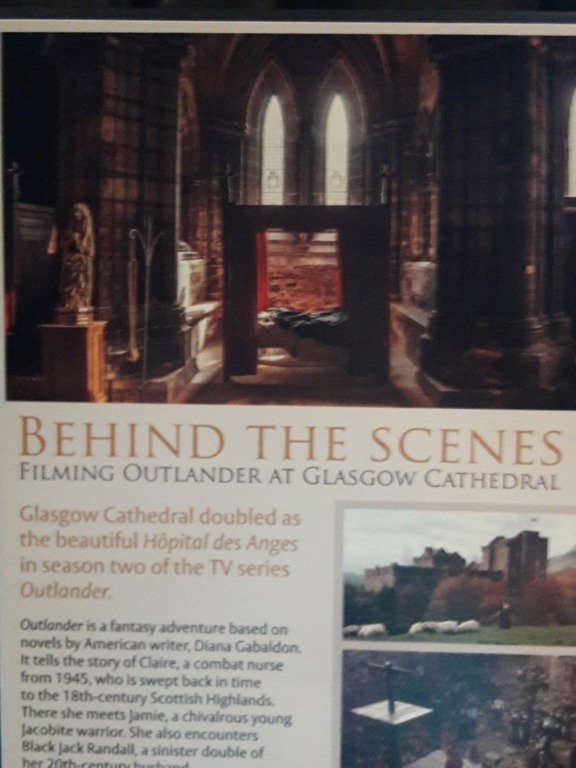 We went downstairs to the lower crypt where shooting for season 2 had taken place, standing for the Hopital des Anges in Paris. 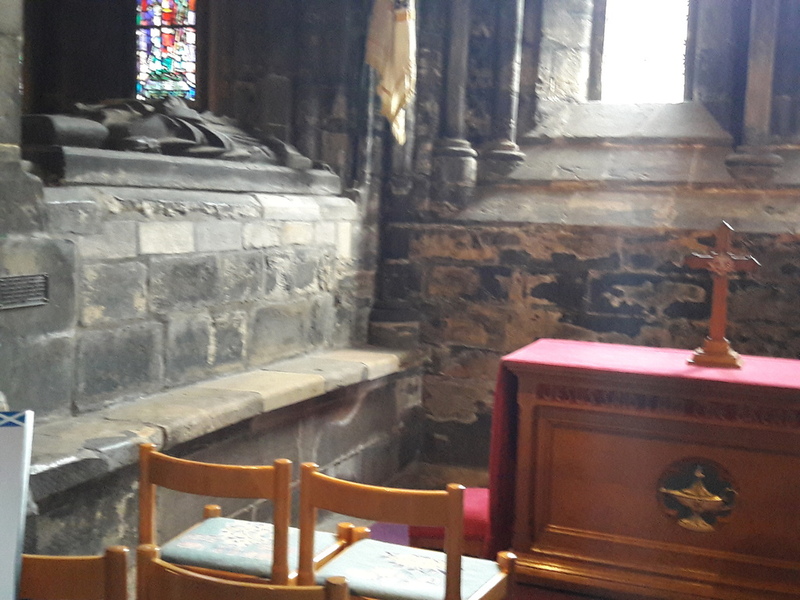 The bed where Claire was lying in after her miscarriage was built in front of this sarcophagus of a bishop. We left this impressive building for a short stop in the pub across the road, in the Cathedral House Hotel and started our last day in bus. 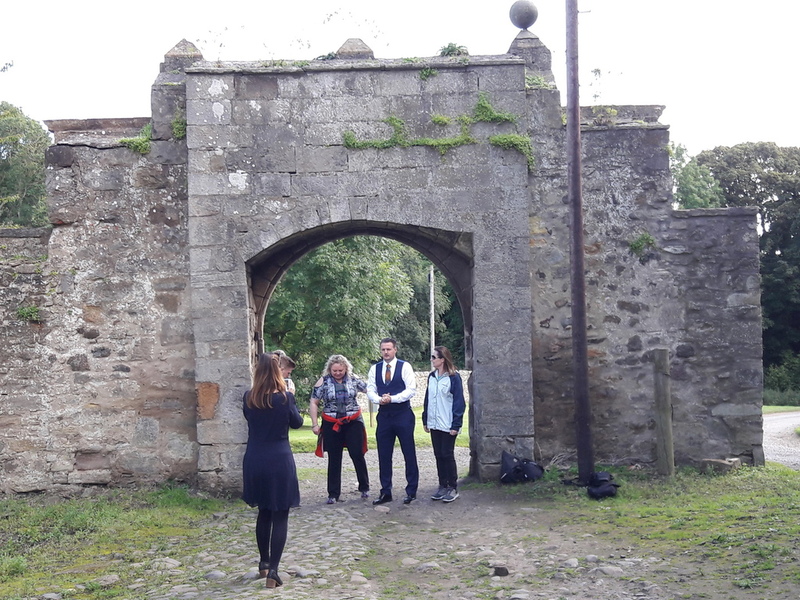 This day, we were accompanied by Gillebride MacMillan who played and sang the role of the bard in season 1 on Castle Leoch. 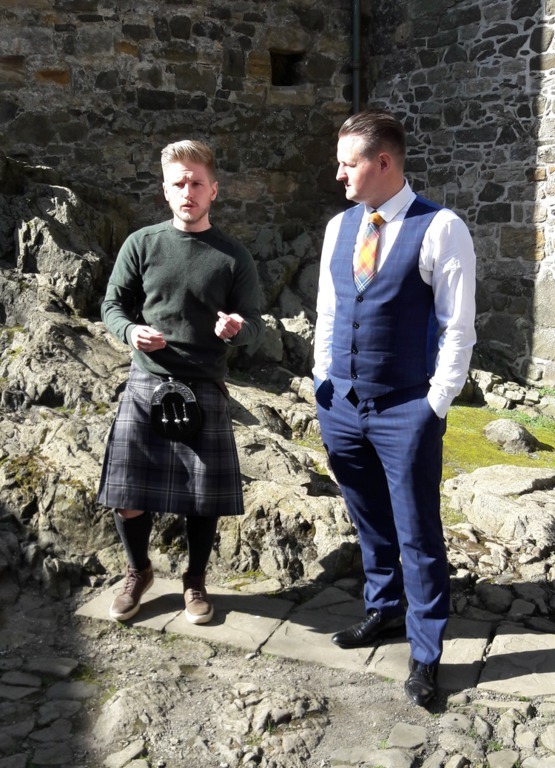 I knew him already from two previous events Gathering in Cologne, he’s really nice and open, a wonderful a capella singer and he’s a native Gaelic speaker, very rare nowadays. He learned English only at school at the age of 6 (Gary Lewis, who played Column MacKenzie, attended the same school!). For the role of the bard, he sang the songs a few days earlier in studio, they didn’t let him sing live and additionally, he didn’t play the harp himself either. In Scotland, the harp is traditionally an instrument for girls, boys rather play the bagpipes. Whilst on the road, he told us about the shootings (4 days at 14-16 hours each for a few minutes on TV! 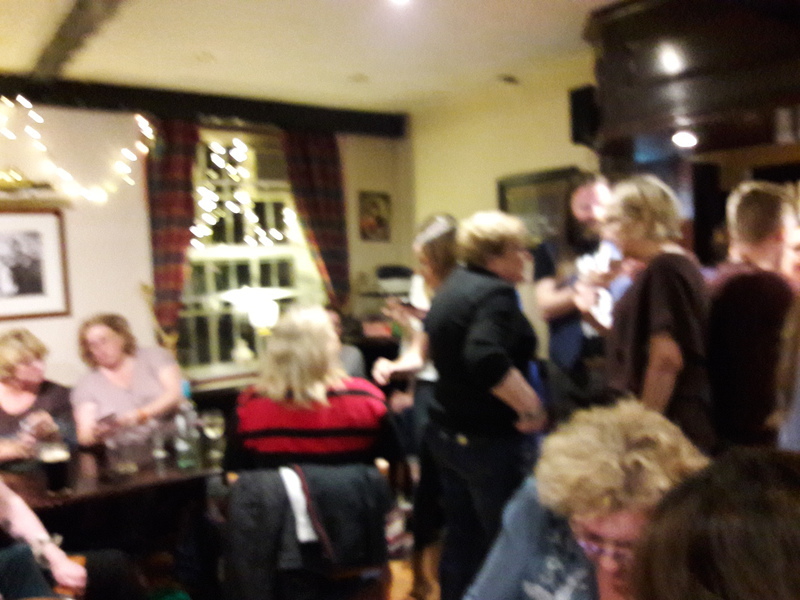 ), about Scottish history and sang one song after another in Gaelic. Even though we didn’t understand the words, they were striking. Story telling has a long tradition in Scotland and was important to pass history and new on to others. When sitting together in the evenings, particularly in winter, tradition was kept alive, passed on to the next generation and by this was preserved. Travellers were very appreciated because they usually brought news from other parts of the country and entertainment. With Caitriona Balfe who is Irish, Gillebride often talked Irish, he can speak that language, too, as well as Spanish and Galician (northern Spain), where his wife is from and they have been living there for a few years. Their kids speak all four languages! Currently, he’s working on his next studio album to be released in 2018. He just came back from Edinburgh festival the other day and so he first sang the 3 songs from season 1 for us and the Skye Boat Song. This song has not been composed for Outlander like so many others, this used to be a folk song, based on the story how Bonnie Prince Charlie flew to the Isle of Skye with Flora MacDonald, disguised as her maid, after the battle of Culloden was lost. Then more songs, one of them Killiecrankie (Roger sings this song in book 4, book readers will remember that Roger is quite a singer, I’m looking forward to see how they’ll play this out in TV). 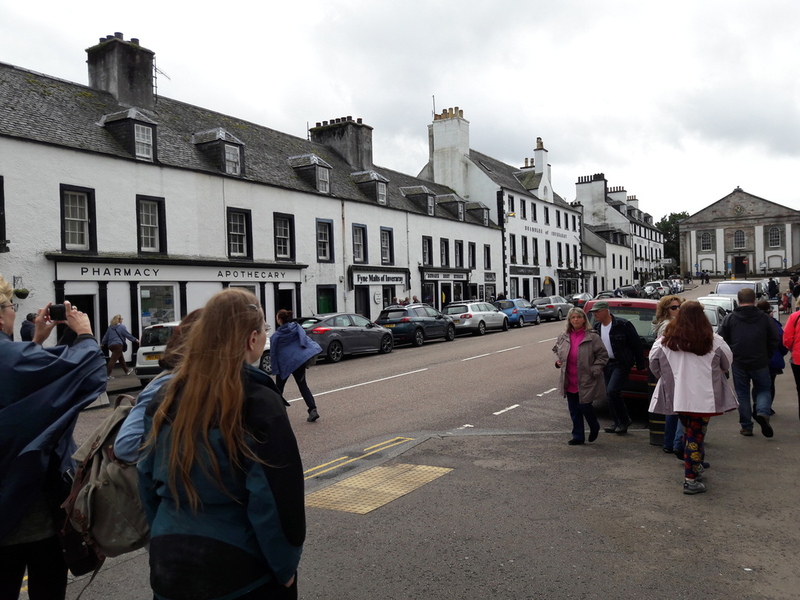 Now we arrived in Pitlochry where we had much more time than two days ago, for lunch, shopping tour and whatever we wanted to do. We didn’t intend to go shopping, so Lynn and I chose a table on the terrace of a restaurant and had a very cosy lunch together. The sun was shining, it was warm and comfortable with a pretty view, that didn’t leave a lot to be desired. If you ever happen to be in the region, this village is a MUST to visit! 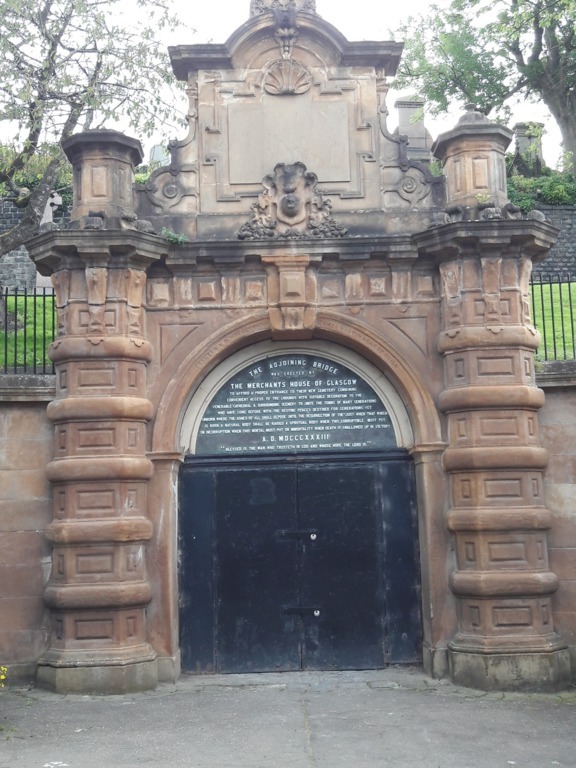 On our way to our next station, Gillebride told us the story how he came – trough the appearance in Outlander and a common friend – to appear also on a birthday party of Sean Connery, who is Scot and famous supporter of a Scottish referendum and how he there made the acquaintance of Sarah Jessica Parker. 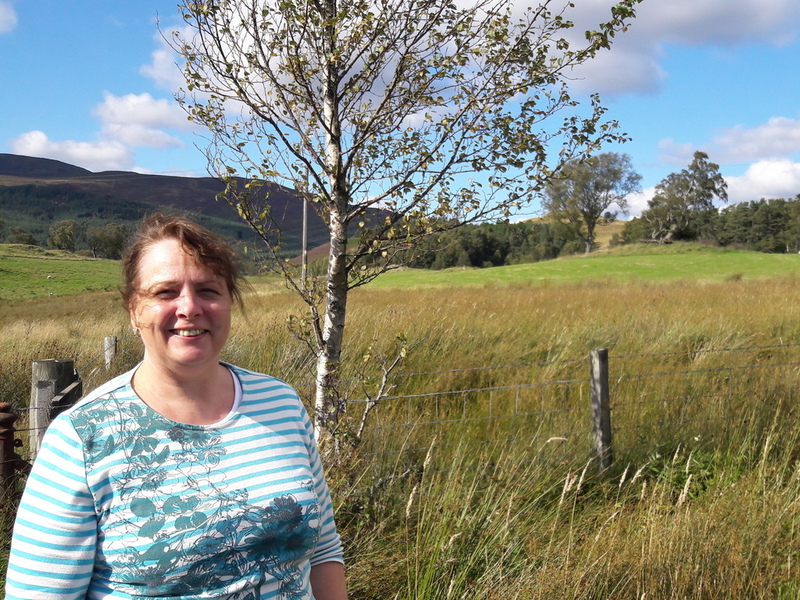 We drove to the countryside of Kinloch Rannoch, a picturesquely beautiful region with pretty woods, lakes/lochs and high mountains where Catriona was searching for a very special place, by the help of travel directions given by a friend (turn left after the small bridge – alone, there were so many small bridges! 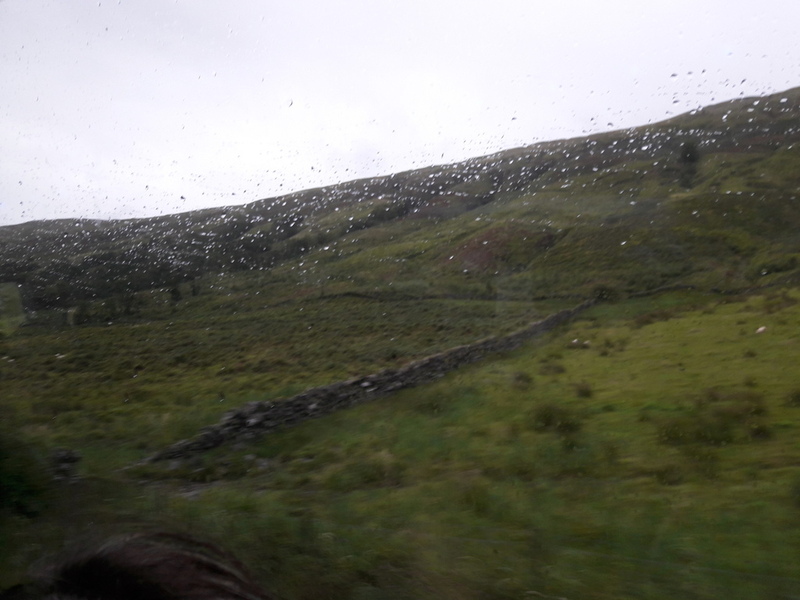 ), searching for the shooting place of the famous magic circle of stones Craig na Dun. We couldn’t find it first, were about to give up, but after turning and driving in the opposite direction, we found it to our left. Unfortunately, it’s located on private property and cannot be visited directly, but without further ado, our driver stopped and let us get out to take some unforgettable pictures! They are taken from the backside from the hill, not from the front side we know from TV, but everybody will recognize the trees nevertheless. 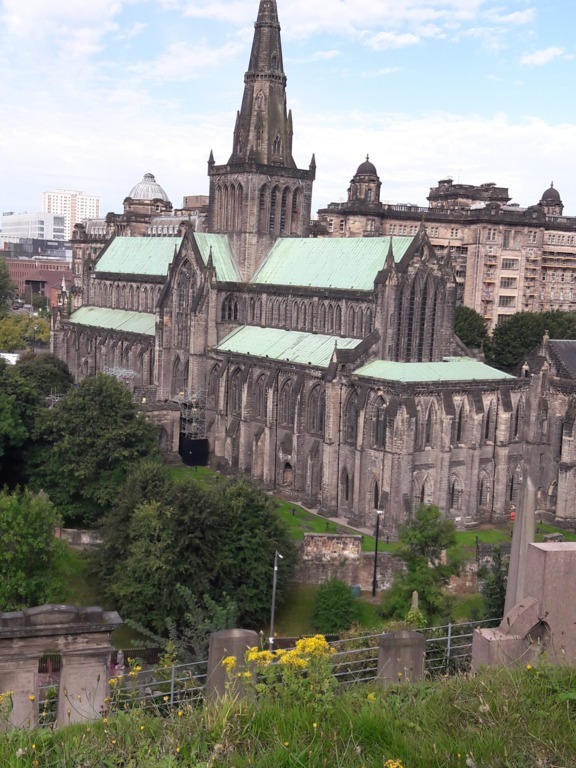 This was the last destination of our bus tour and so, we returned one last time to the city of Glasgow. 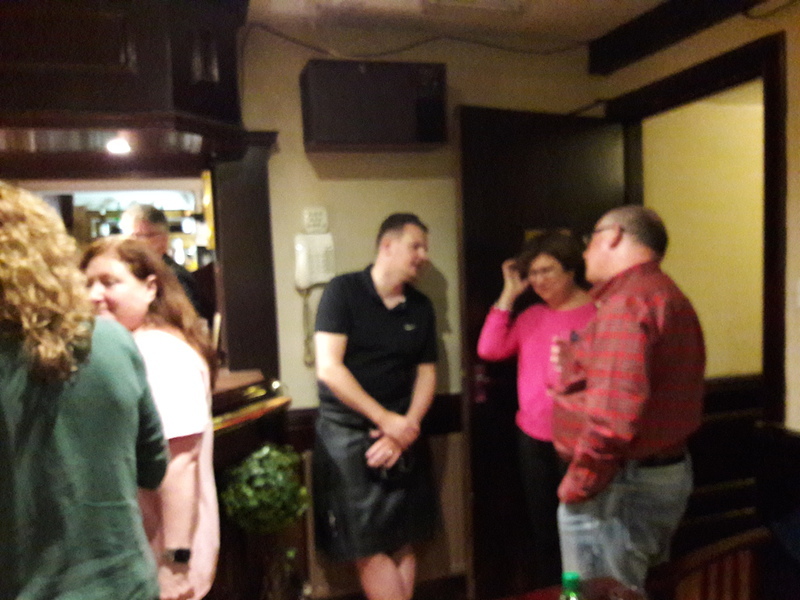 We split up for a short time to get back to our rooms in order to jazz ourselves up for the goodbye party in the pub of the Argyll Hotel. 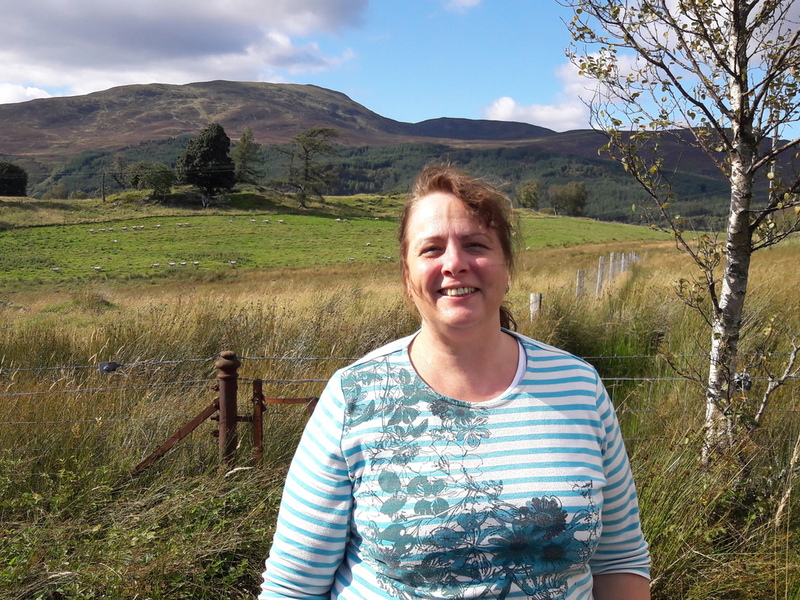 Catriona had brought her complete family, meaning her husband and 3 kids. Scott and Jay had brought their wives and so, the pub was crowded and noise level really high. I drank two cans of tea with sugar to help my sore throat, but that could helm only for a certain time. 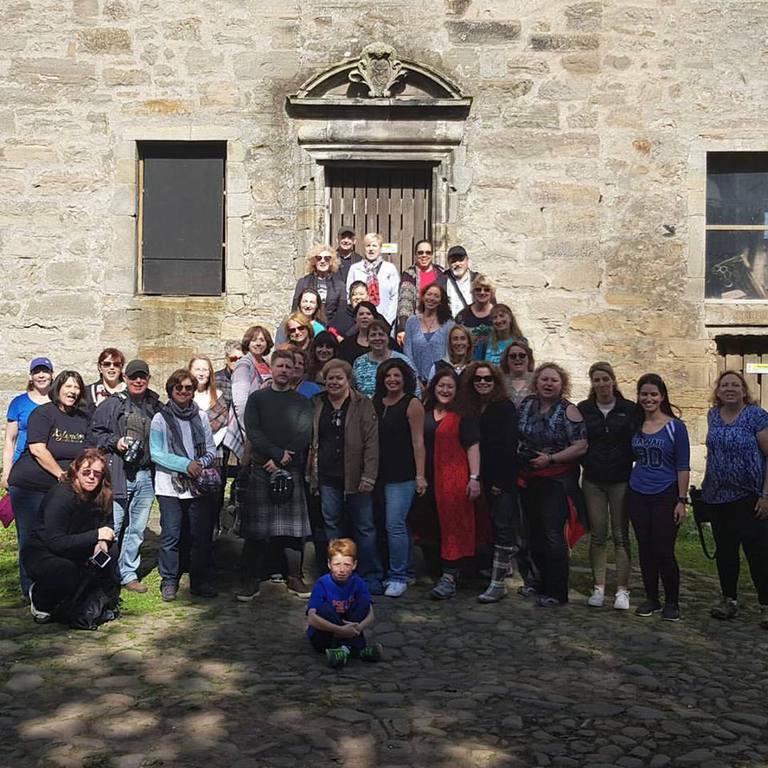 Unfortunately, my cell phone pictures are a little blurred, but this was a nice and wistful goodbye, all of us had found many new friends and we had also grown together as an Outlander “family”, so many contact details were exchanged, many heartily hugs until we finally had to part. 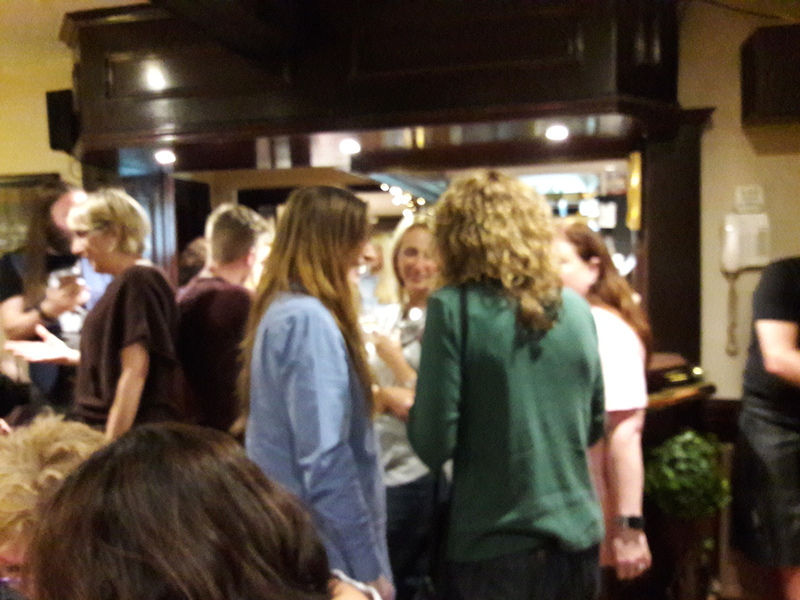 Some of us started a pub tour which lasted until 3 or 4 in the morning, so I’ve been told later. Not all of us would immediately return to their home countries, some had booked additional tours with Catriona, others would continue on their own or visit more European countries. 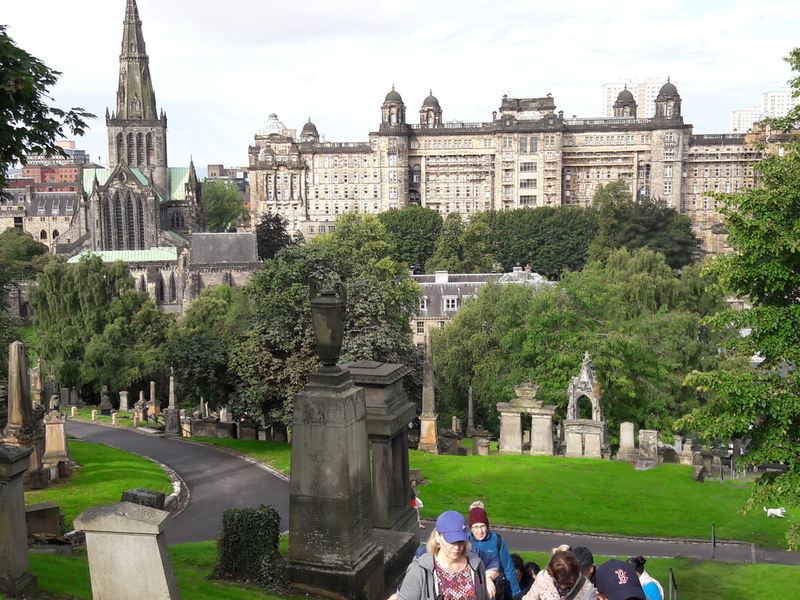 For those who came from America and particularly Australia, Europe meant quite a travel distance, so they planned their travel tour through Europe about several weeks and Scotland was just a part of their trip. Love, regards and many hugs to all who were in!! !